about 1 month ago, Mark Dominguez, Supt. The HS Track Team will travel to Angelo State University on Fri. 4/26 and Sat. 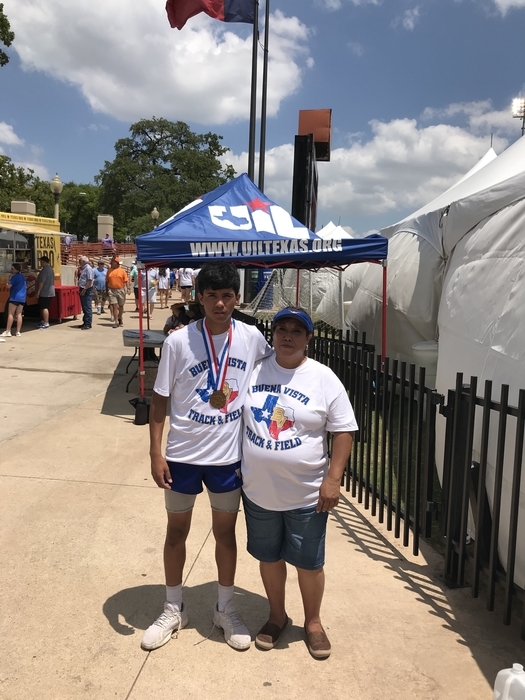 4/27 to compete in the Regional Track Meet. Attached is a schedule of events. 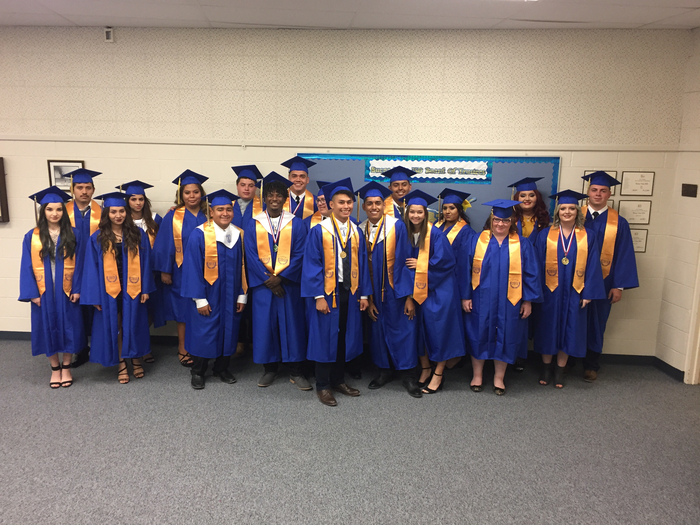 The track is located at 2601 W. Avenue N San Angelo, Texas 76909. Good Luck and Hook 'em Horns. 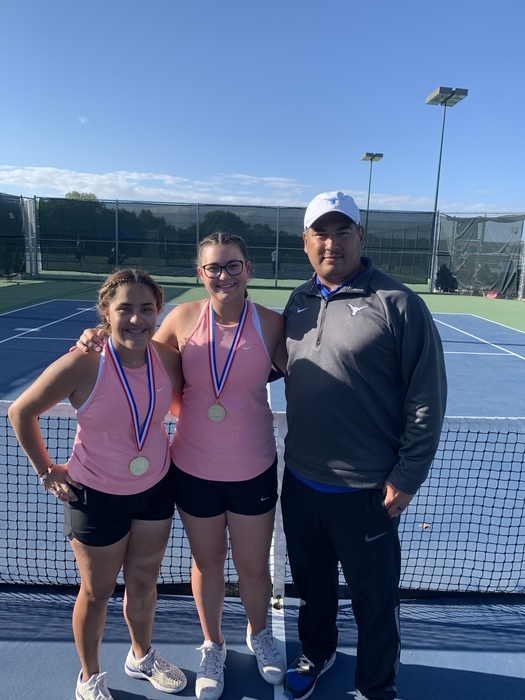 Congratulations to the Region II Girl’s Doubles Champions & Coach Martinez!!! 2 days ago, Mark Dominguez, Supt. 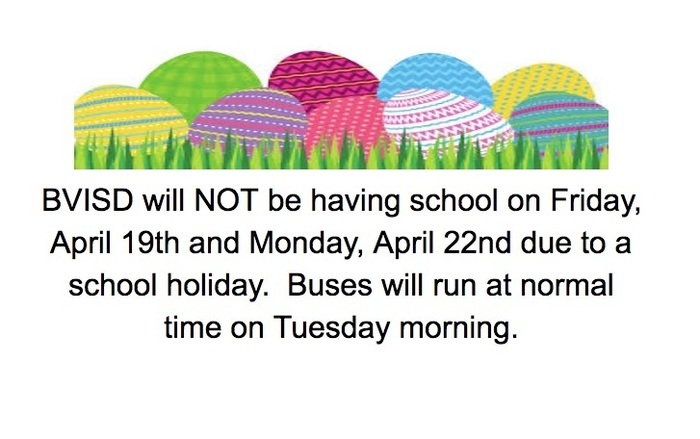 BVISD will NOT be having school on Friday, April 19th and Monday, April 22nd due to a school holiday. Buses will run at normal time on Tuesday morning. 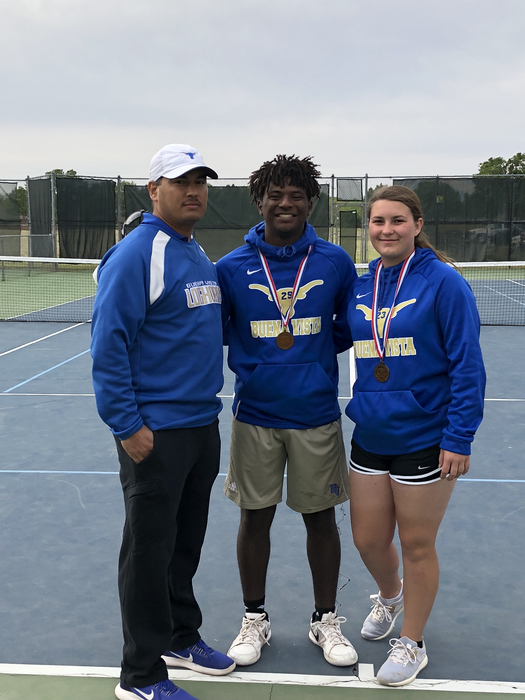 The HS Tennis Team will compete in the Regional Tennis Meet this Wed. & Thurs at Angelo State University. Courts are located at Bentwood Country Club 2111 Club House Lane San Angelo TX 76904. Good Luck and Hook 'em Horns. The HS track team will travel to Wink to participate in the Area Round Track Meet. Attached is a schedule of events. Schedule is subject to change. Good Luck and Hook 'em Horns. Don't forget!!! 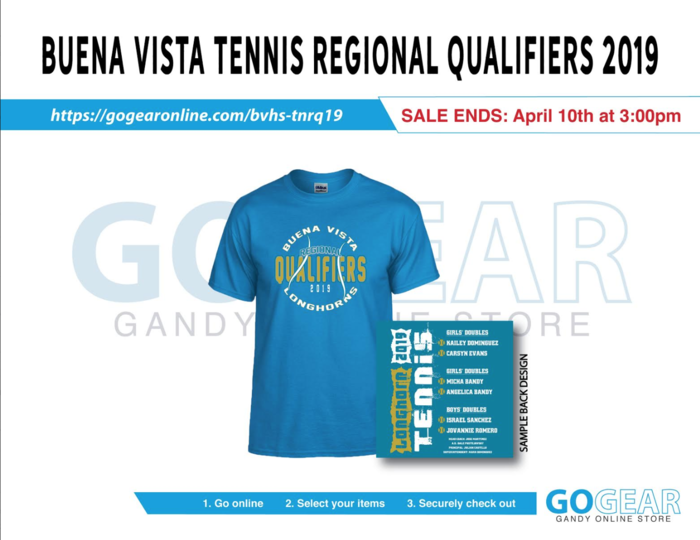 The SALE for Regional Tennis Shirts ends today at 3:00. 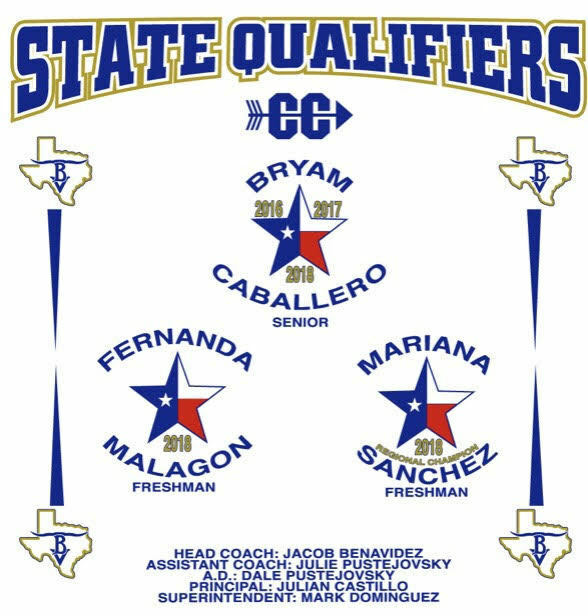 Hurry and order one to show your support for our Regional Qualifiers. Go Longhorns. The Jh Tennis teams will travel to Wink on Sat. 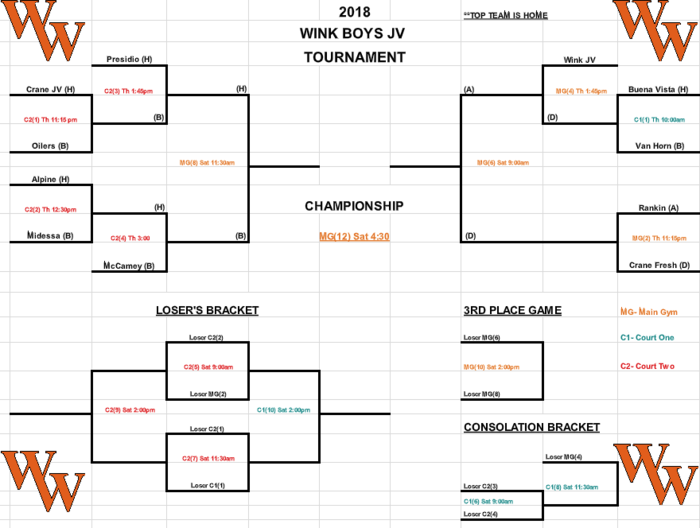 4/13 to compete in the Wink Tournament. Matches begin at 8:30am. Good Luck and Hook 'em Horns. 18 days ago, Mark Dominguez, Supt. The Little Dribblers will play this Mon 4/1. PK-K start at 5:30 in the old gym. 3rd-4th will start at 5:45 in the new gym. 1st-2nd girls will start at 6:00 in the old gym. 5th-6th will start at 6:15 in the new gym. 1st-2nd boys will start at 6:30 in the old gym. The HS Track Teams will travel to Sanderson on Thurs. 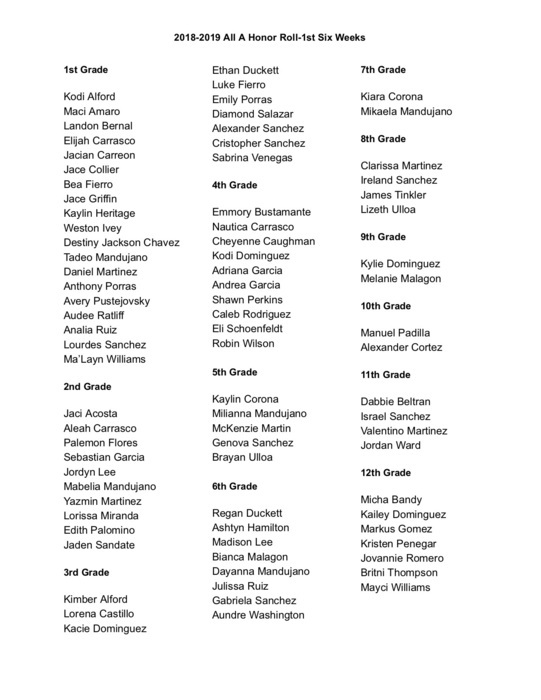 4/4 to participate in the District Track Meet. Attached is a schedule of events. Good Luck and Hook 'em Horns. The JH Tennis Teams will travel to Sanderson on Fri. 4/5 to participate in a duel. Matches start after school. good Luck and Hook 'em Horns. The HS Tennis team will travel to Sanderson on Mon. 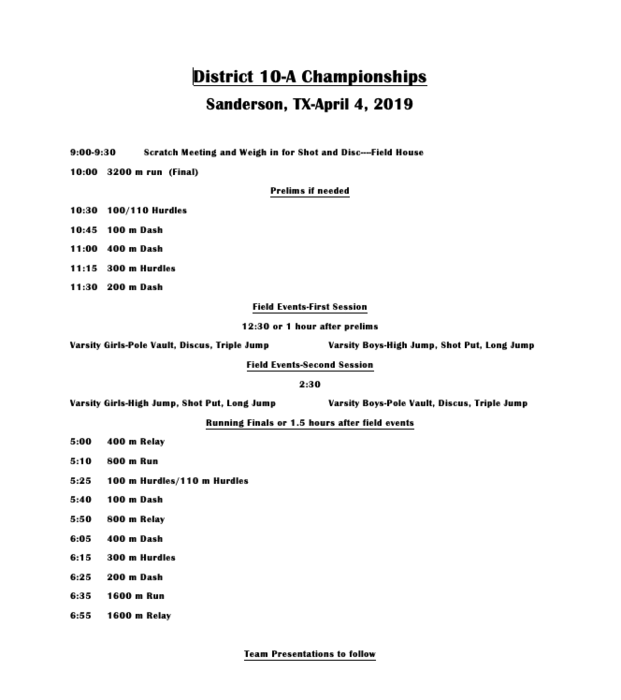 and Tues. 4/1-4/2 to participate in the District Meet. Matches start in the morning. Good Luck and Hook 'em Horns. Spring Sports pictures will take place on Wednesday, April 3rd. The JH Dist. 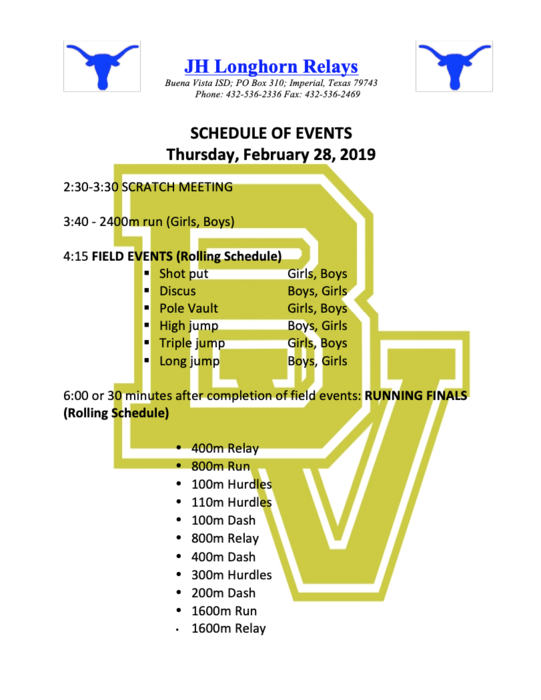 Track Meet will resume this Sat. 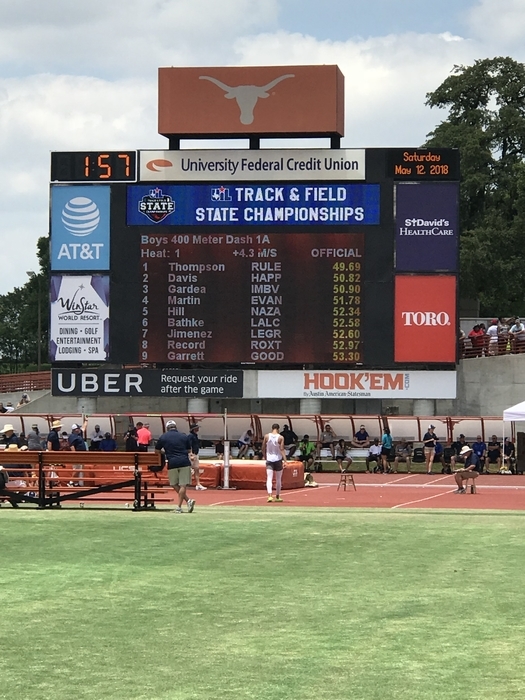 (3/30) at 9:30am at the Longhorn Stadium. 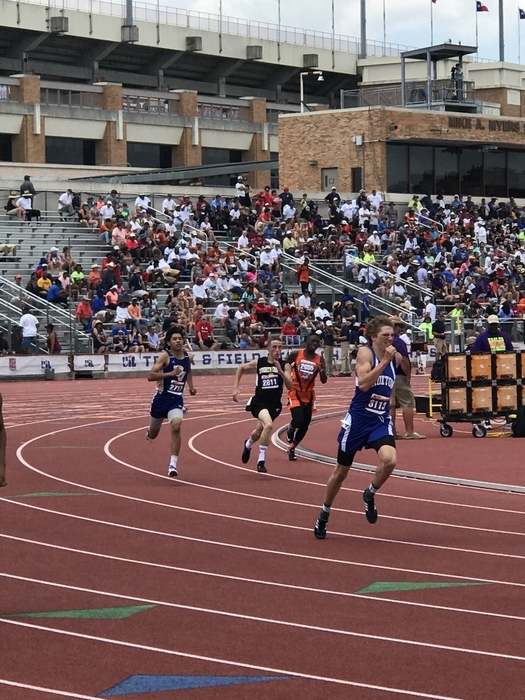 We will continue with the rest of the events starting with the boys 400 meters. Parents with JH track athletes, please have your child at school by 9:00am for preparation and proper warm up. JH track meet has been called off due to weather. 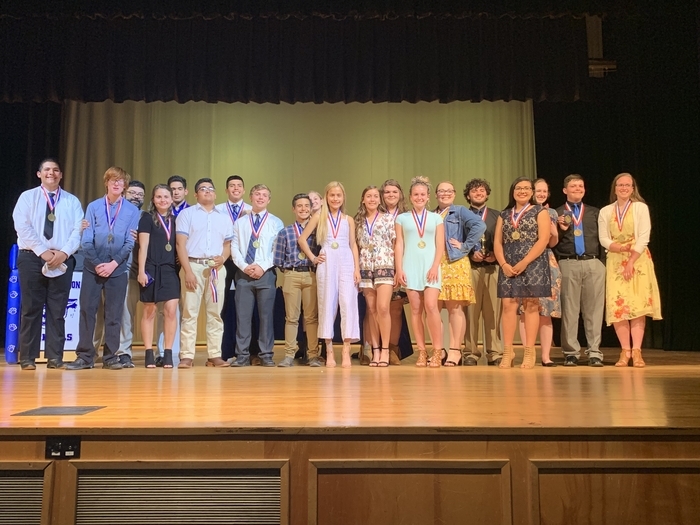 Congratulations to OAP Director Mark Dominguez , his cast & crew on advancing to the Area competition! 24 days ago, Mark Dominguez, Supt. The Little Dribblers are scheduled to play this Tues. 3/26. PK-K start at 5:30 in the old gym. 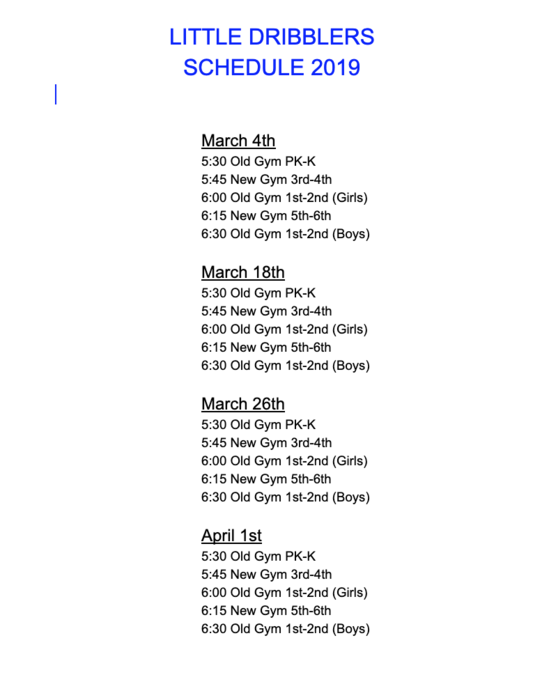 3rd-4th will start at 5:45 in the new gym. 1st-2nd girls will start at 6:00 in the old gym. 5th-6th will start at 6:15 in the new gym. 1st-2nd boys will start at 6:30 in the old gym. The HS Tennis teams will travel to Sanderson this Fri 3/29 to compete. Matches will begin after an 8:30am meeting. Good Luck and Hook 'em Horns. 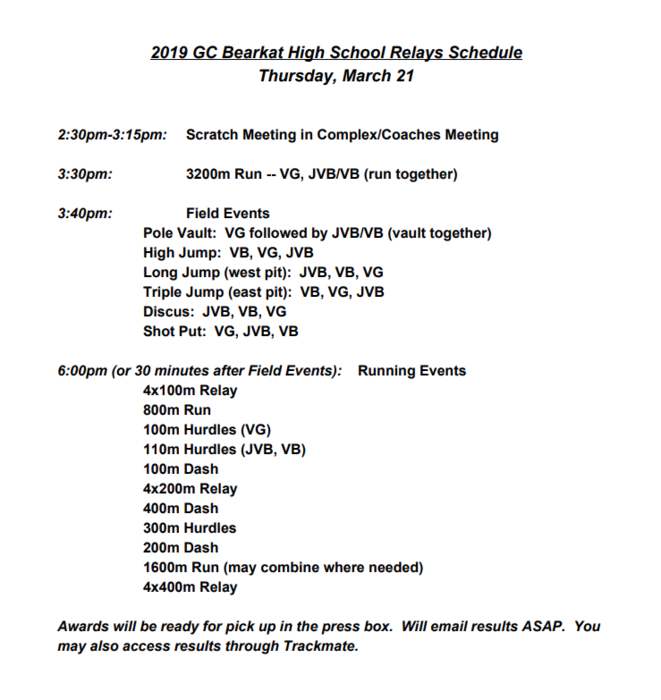 The HS track teams will travel to Wink this Fri. 3/29 to compete in the Wink relays. Attached is a schedule of events. Good Luck and Hook ' em Horns. Thurs. 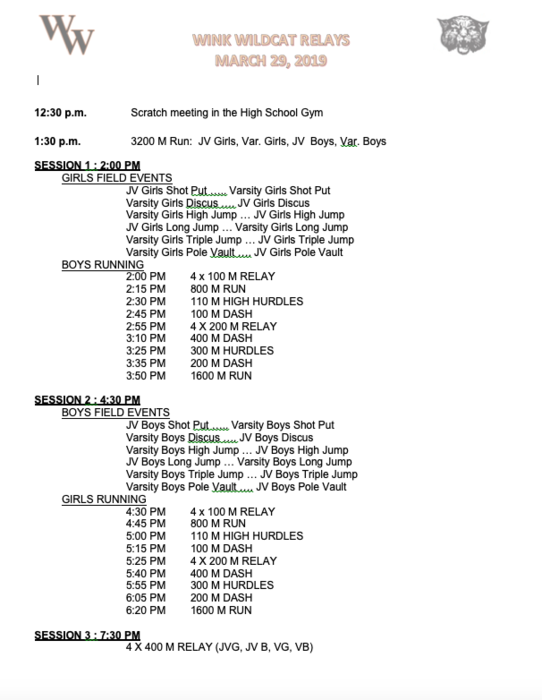 3/28, The JH track teams will compete in the JH District Track Meet at Buena Vista. Attached is a schedule of events. Good Luck and Hook 'em Horns. 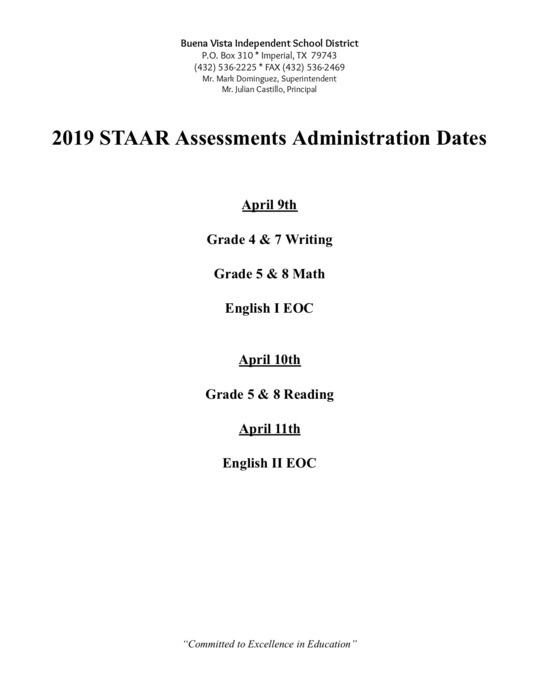 1st Round of STAAR testing will take place on April 9th-11th. The JH tennis teams will travel to Fort Stockton on Sat. 3/23 to compete. Matches will take place at the High school beginning at 8:15am. Good Luck and Hook 'em Horns. The HS tennis team will travel to Wink on Fri. 3/22 to compete. Matches start at 8:15am. Good Luck and Hook 'em Horns. 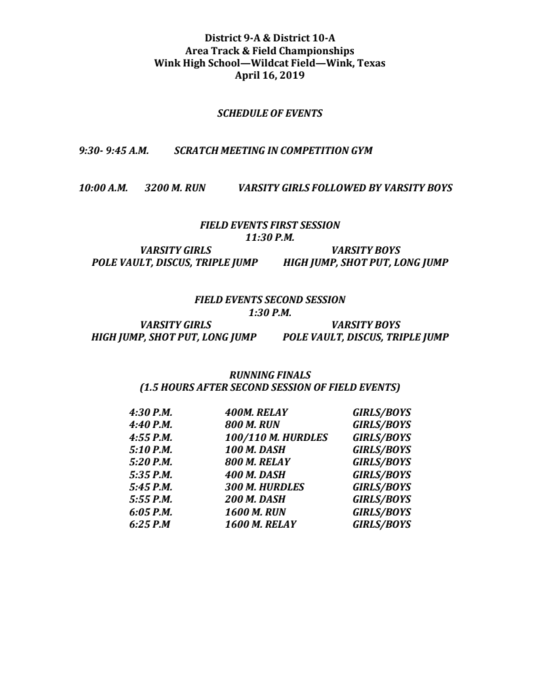 The JH track team will compete at the Garden City Relays on Fri. 3/22. A schedule of events is attached. Good Luck and Hook 'em Horns. 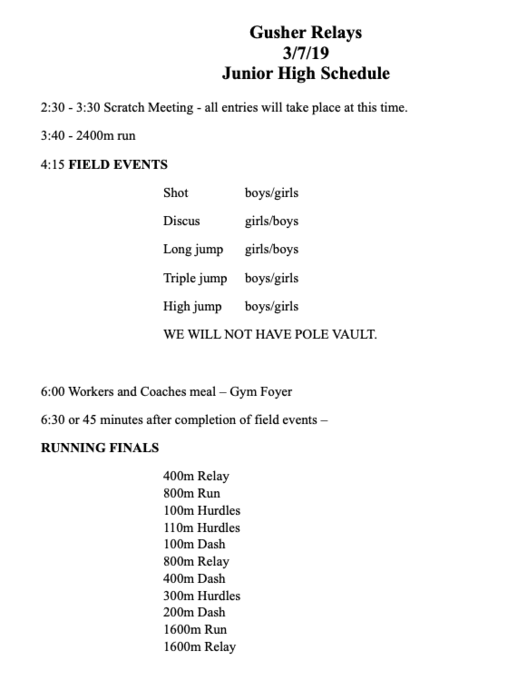 The HS track team will compete at the Garden City Relays on Thurs. 3/21. A schedule of events is attached. Good Luck and Hook 'em Horns. The JV tennis team will travel to Wink on Tues. 3/19 to play in a tourn. The tournament will begin at 8:15 am. Good Luck and Hook 'em Horns. Little Dribblers will play again tonight. PK-K start at 5:30 in the old gym. 3rd-4th will start at 5:45 in the new gym. 1st-2nd girls will start at 6:00 in the old gym. 5th-6th will start at 6:15 in the new gym. 1st-2nd boys will start at 6:30 in the old gym. Hook 'em Horns. 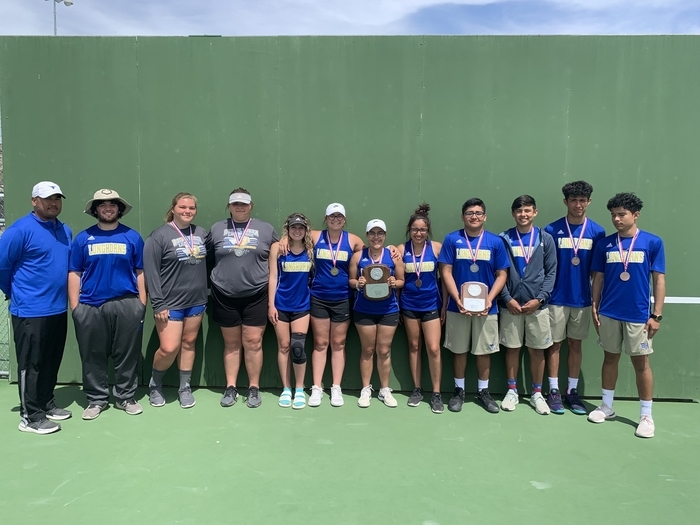 The HS tennis players will travel to Irion County on Fri, 3/8, to compete. Matches start at 8:30 am. Good Luck and Hook 'em Horns. 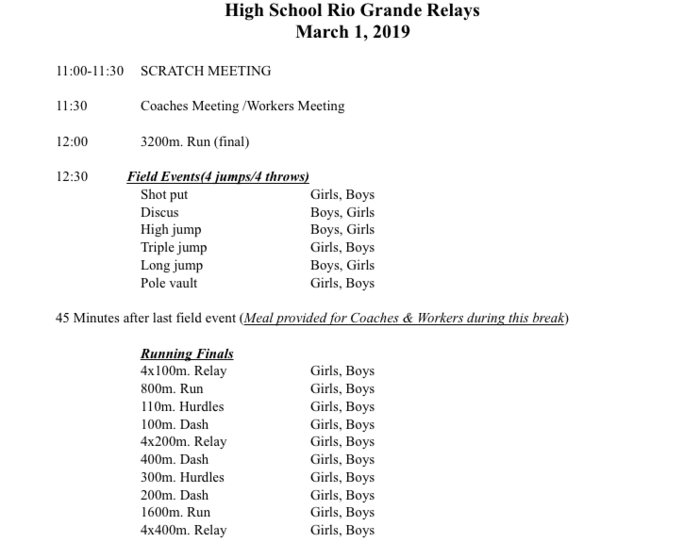 The HS boys and girls track teams will travel to Grandfalls on Fri., 3/8, to run in the Gusher Relays. Attached is a schedule of events. Good Luck and Hook 'em Horns. 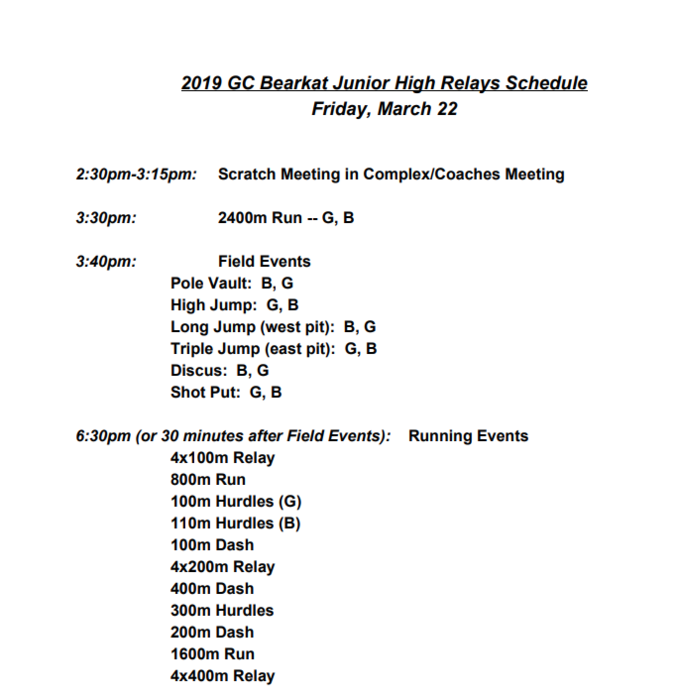 The JH boys and girls track teams will travel to Grandfalls on Thurs., 3/7, to run in the Gusher Relays. Attached is a schedule of events. Good Luck and Hook 'em Horns. 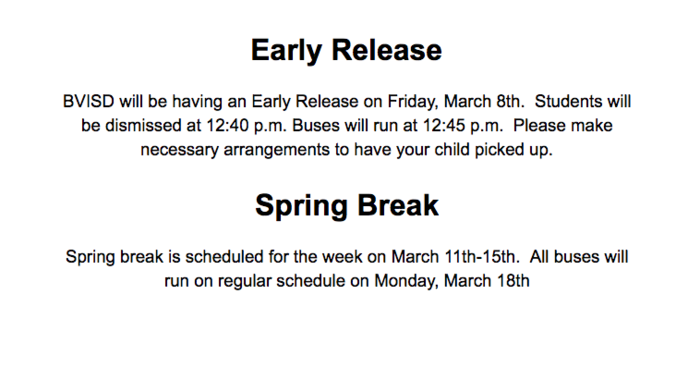 BVISD will be having an Early Release on Friday, March 8th. Students will be dismissed at 12:40 p.m. Buses will run at 12:45 p.m. Please make necessary arrangements to have your child picked up. Don't forget! Little dribblers starts today. PK-K start at 5:30 in the old gym. 3rd-4th will start at 5:45 in the new gym. 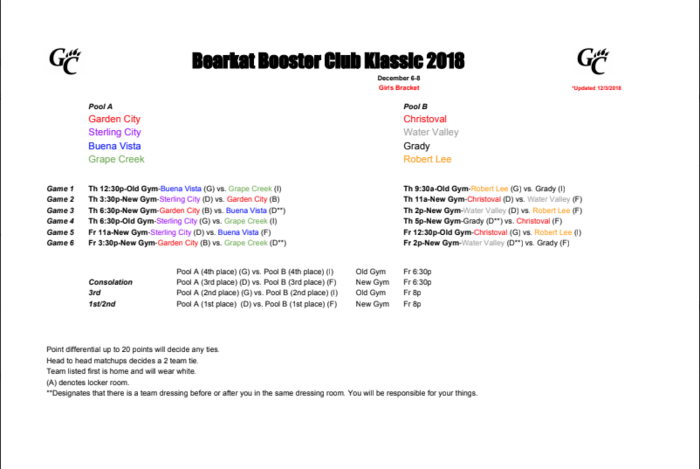 1st-2nd girls will start at 6:00 in the old gym. 5th-6th will start at 6:15 in the new gym. 1st-2nd boys will start at 6:30 in the old gym. Hook 'em Horns. Little dribblers will began on Mon., 3/4 at 5:30. Please see attached schedule for dates and times. 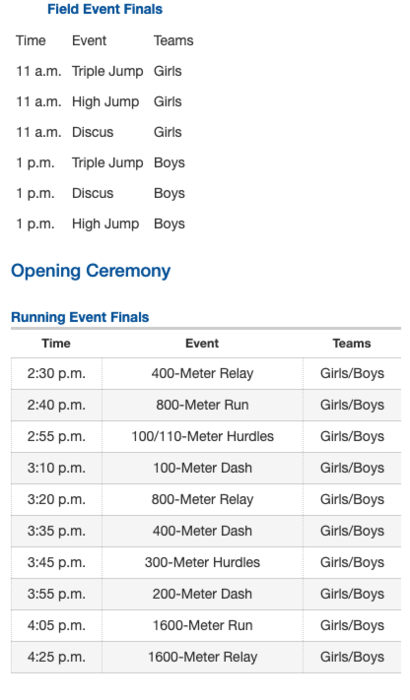 The HS Track team will travel to Sanderson Fri., 3/1 to participate in the Rio Grande Relays. Attached is a schedule of events. Good Luck and Hook 'em Horns. 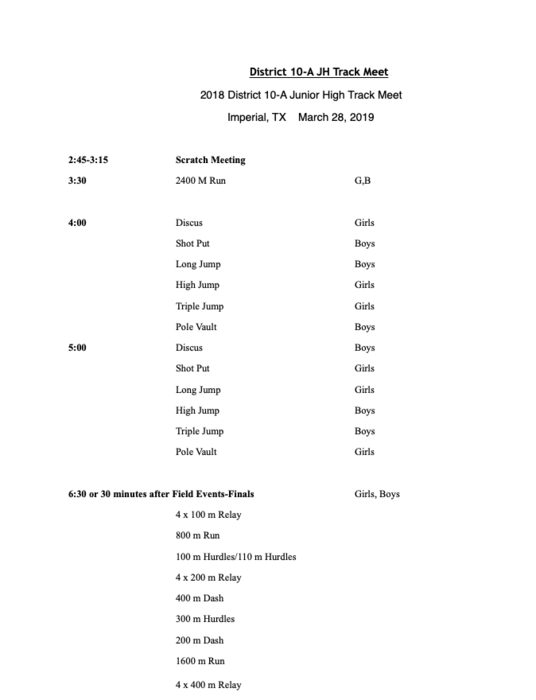 The JH track team will participate in the Longhorn Relays in Imperial on Thrus., 2/28. A schedule of events has been attached. Good Luck and Hook 'em Horns. The HS tennis team will travel to Sanderson Tues., 2/26 to play a duel. Good Luck and Hook 'em Horns. 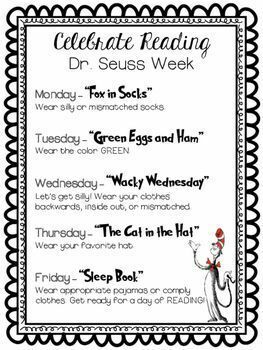 Our Elementary students will be celebrating Dr. Seuss’s Birthday this week February 25th -March 1st. 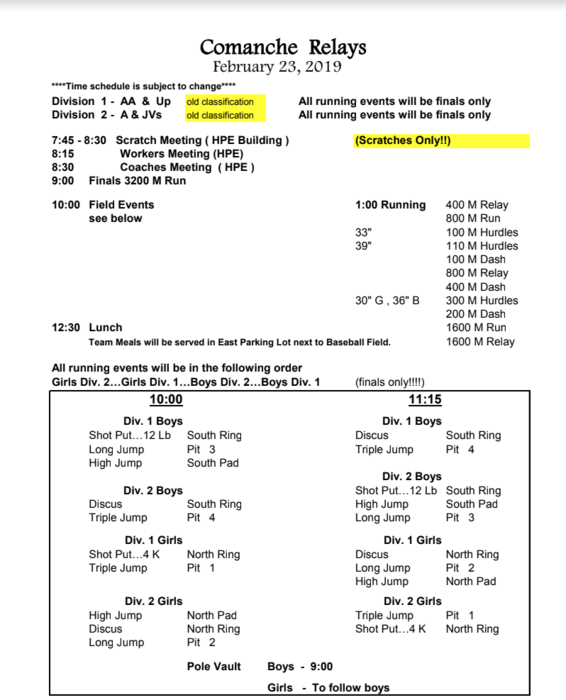 Attached is the schedule for the Comanche Relays on Feb 23 for HS Track. Coyanosa bus is running late this morning. Coyanosa bus is running behind due to bus troubles. Bus pick up will be delayed approximately 30 minutes. The VB Basketball team will play in the Bi-District playoff game on Tues., 2/19, at Sul Ross at 7:30 against Sierra Blanca. HS tennis will play in the Forsan tourn. on Thurs., 2/21. 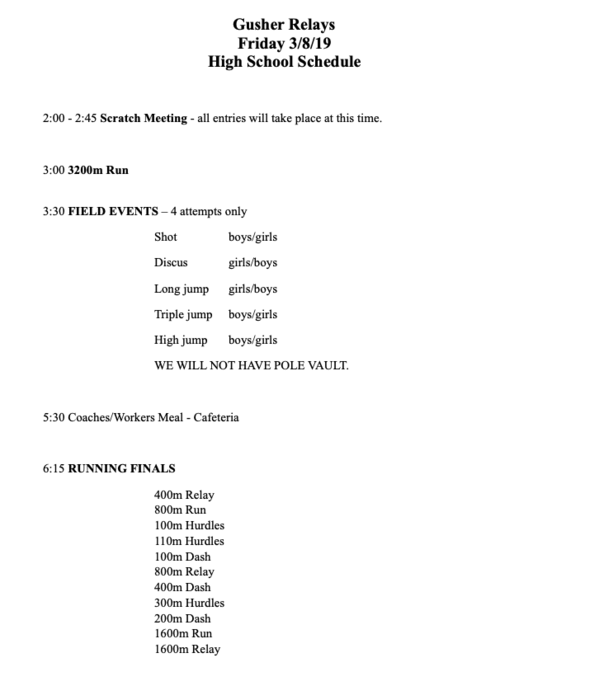 HS track will run in the Fort Stockton Meet Sat., 2/23. Good Luck and Hook 'em Horns. 2 months ago, Mark Dominguez, Supt. 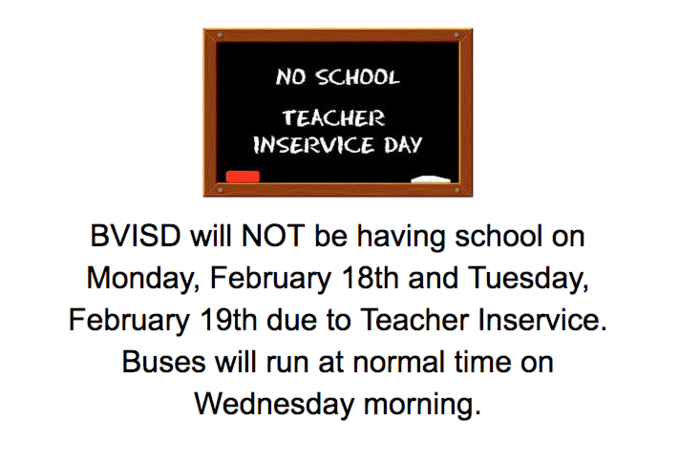 BVISD will NOT be having school on Monday, February 18th and Tuesday, February 19th due to Teacher Inservice. Buses will run at normal time on Wednesday morning. The VG area round basketball playoff game has been set for Thurs., 2/14, at Reagan County HS in Big Lake at 6:30 against Veribest. Come support the girls and be loud. Good Luck and Hook ‘em Horns. Congratulations to the VB basketball team for making the playoffs . They will be playing Sierra Blanca at Sul Ross in Alpine on Tues., 2/19, at 7:30. Good Luck and Hook ‘em Horns. The VB b-ball team will play Grandfalls Tues., 2/12, at home. The game will start at 6:00. Good Luck and Hook ‘em Horns. 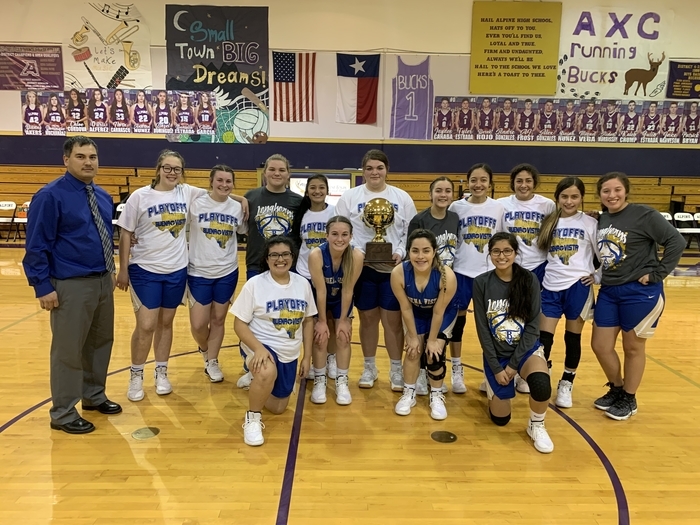 Girl’s Bi-District Playoff update: BV -40 Balmorhea 11 @ 1/2. 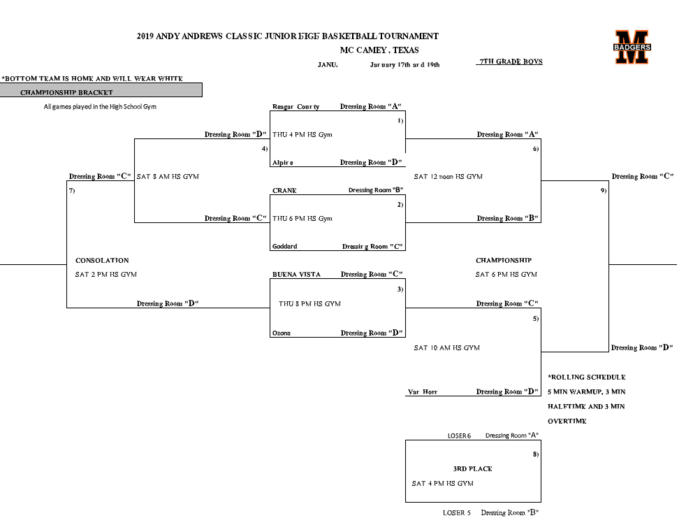 The VG basketball team will play a playoff game against Balmorhea next Mon., 2/11, at Alpine HS. The game will start at 6:00. Good Luck and Hook ‘em Horns. The 8th grade girls and Jh boys basketball teams will travel to Grandfalls today, 2/4, to play. Games start at 5:00. VG & VB will play Sanderson at home on Tues. at 6:00. The VB will travel to Marathon on Fri., 2/8, to play at 6:00. Good Luck and Hook 'em Horns. All basketball games tonight,2/1, with Midland Trinity have been canceled. The JVG b-ball game tonight at Midland Trinity has been canceled. VG will still play at 6:00 with VB to follow. The gym is located at 3500 W Wadley Ave, Midland. Good Luck and Hook ‘em Horns. The 8th grade girls and Jh Boys BBall teams will play at home against Marathon at 5:00 on Mon., 1/28. The 7th grade girls BBall team will travel to play St. Marys at 5:00 on Thurs., 1/31. The gym is located at 1703 Adams Ave Odessa. Good Luck and Hook 'em Horns. 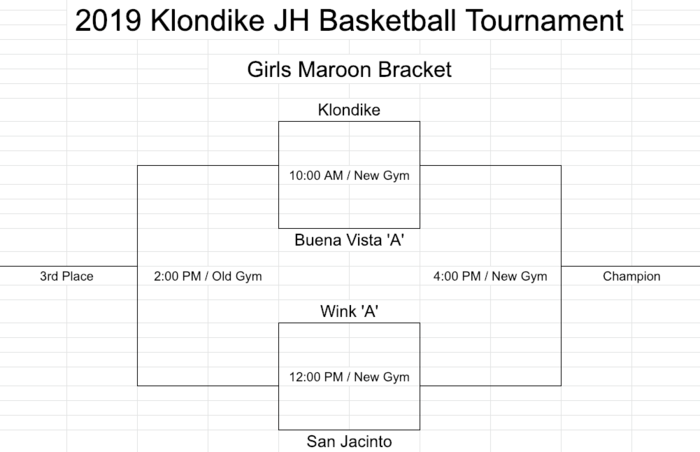 The 7th and 8th grade girls BBall teams along with the JH Boys team will play in the Klondike BBall Tourn. this Sat., 2/2. Please see tourn brackets attached for game times. Good Luck and Hook 'em Horns. On Tues., 1/29, at home Vs Rankin, the JVG BBall team will play at 5:00 with the VG playing at 6:00 followed by the VB. Good Luck and Hook 'em Horns. 3 months ago, Mark Dominguez, Supt. On Fri.,1/25, the JVG &JVB bball teams will travel to Compass Academy to play at 5:00 while the VB &VG travel to Grandfalls to play at 6:00. Good Luck and Hook 'em Horns. On Tues.,1/22, at 5:00, the JVG bball team will take on Compass Academy at home. At 6:00, the VG bball team will play Grandfalls followed by the VB playing Marathon. Good Luck and Hook 'em Horns. The 7th grade girls basketball team will play at Compass Academy on Mon. 1/21. That game will start at 5:00. 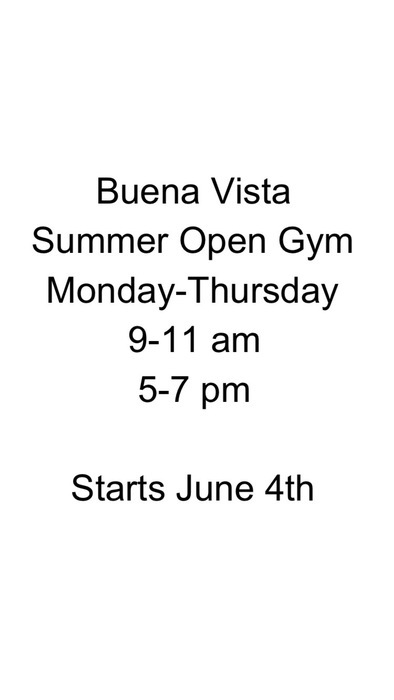 The gym is located at 5530 Billy Hext Rd, Odessa. On Thurs., 1/24, the 8th girls and the JH boys bball team will play in Sanderson at 5:00. Good Luck and Hook 'em Horns. The VB & VG basketball teams will travel to Sanderson this Fri., 1/18, to play. VG will start at 6:00 with VB to follow. Good Luck and Hook "em Horns. 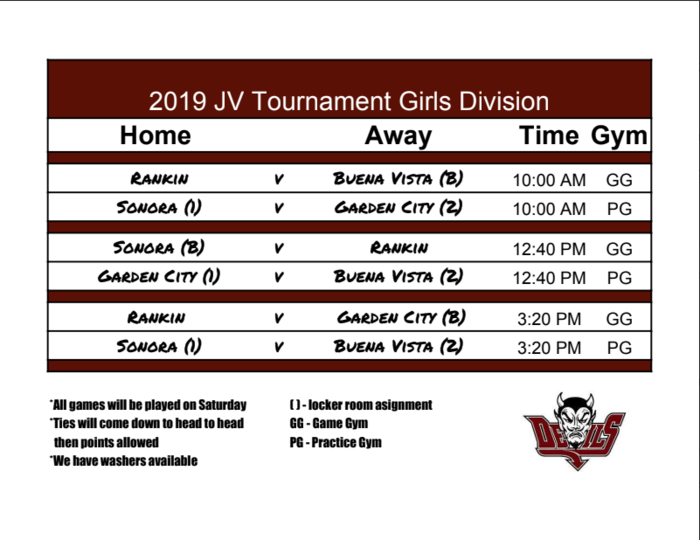 The JVB & JVG will be playing in the Rankin JV Basketball Tourn. this week. 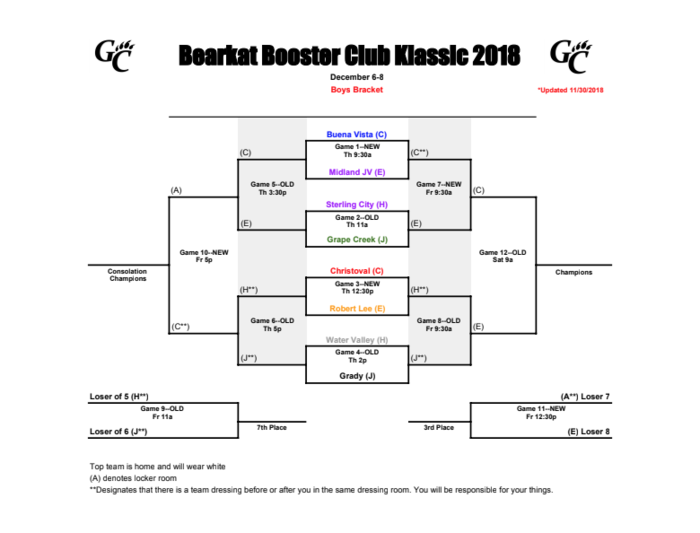 Please see the attached brackets to view opponents and game times. Good Luck and Hook ' em Horns. 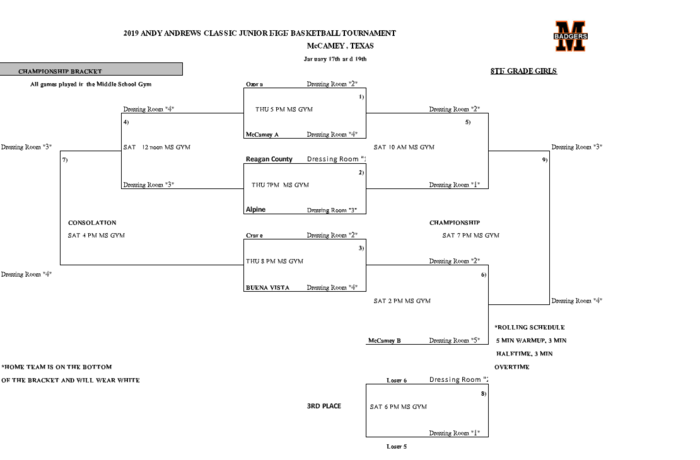 McCamey JH Basketball Tournament Brackets. The JH boys and girls basketball teams are in the McCamey Tourn. this week with games beginning on Thurs., 1/17. Attached is a bracket to view opponents and game times. Good Luck and Hook 'em Horns. The 7th and 8th grade boys and girls basketball teams will play here today, 1/14, against St. Anns. Games start at 5:00. 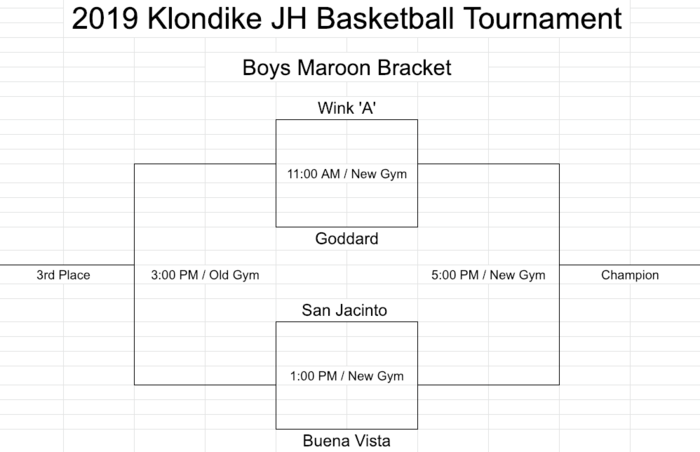 The JVG,VG, & VB basketball teams will travel Van Horn on Tues.,1/15, to play. Games there will start at 4:30. Good Luck and Hook 'em Horns. Coyanosa bus route has just now started & will begin pickup. Coyanosa bus route is running behind due to bus troubles . Route pickup will begin at approximately 7 a.m.
Coy Amos’s bus route is running late due to bus troubles. Bus pickup will begin at approximately 7 pm. 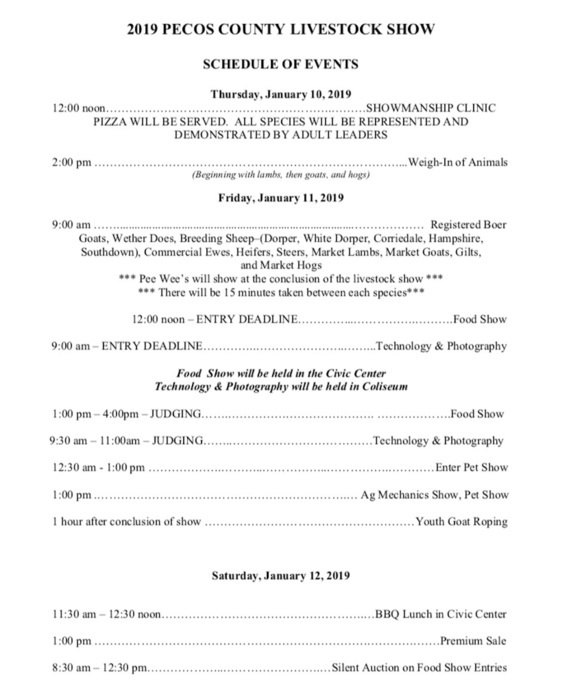 Attached is the Pecos County stock show information. Good luck to all students participating. The JH boys and girls basketball teams will travel to Rankin on Thurs., 1/10. Games will start at 5:00. On Fri.,1/11, the HS basketball teams will travel to Rankin. Games will start at 4:00. Good Luck and Hook 'em Horns. Odessa bus route is currently delayed on Interstate by Road Ranger due to traffic moving slowly. Bus will eventually arrive at bus stop as soon as possible. 4 months ago, Mark Dominguez, Supt. The JVB boys game with McCamey today has been canceled. We will consolidate the jv with varsity to make one team today. Come out and support our PK-3rd Grade Students and teachers as they put on the holiday program tonight at 7:00 pm in the auditorium. Looking forward to a great performance. They have all been hard at work. 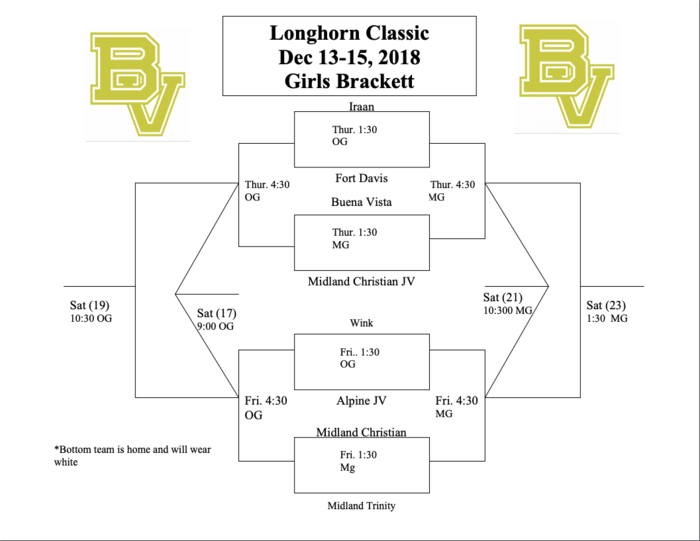 The JVG and JVB basketball teams will play McCamey here on Thurs. 12/20 starting at 2:00. The VG basketball game will follow the JVG and VB basketball game will follow the JVB. Good Luck and Hook ‘em Horns. The 8th grade boys and girls basketball teams will play Grandfalls at home on Mon.12/17. Both games will start at 5:00. The 7th grade boys and girls basketball teams will take on St Marys at home. They will play after the 8th grade teams. Good Luck and Hook ‘em Horns. The 2nd UIL bus has left Rankin. We should arrive in Imperial around 8:30 this evening. 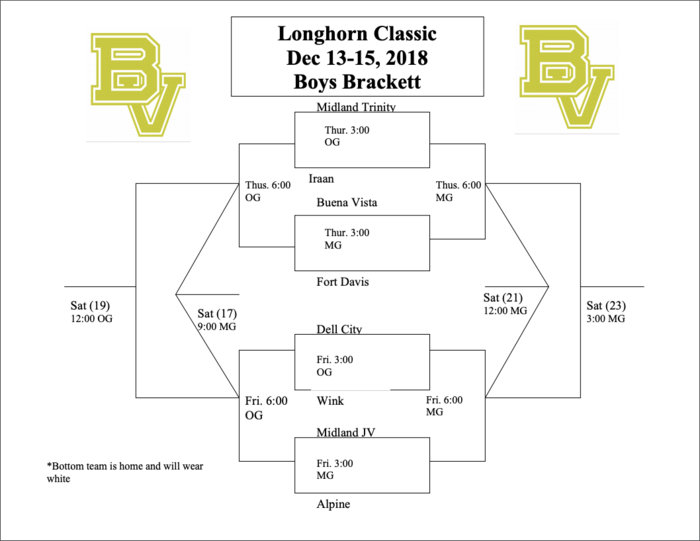 The VB & VG will be playing in the Longhorn Classic Tournament this week. The tournament begins this Thurs., 12/13. 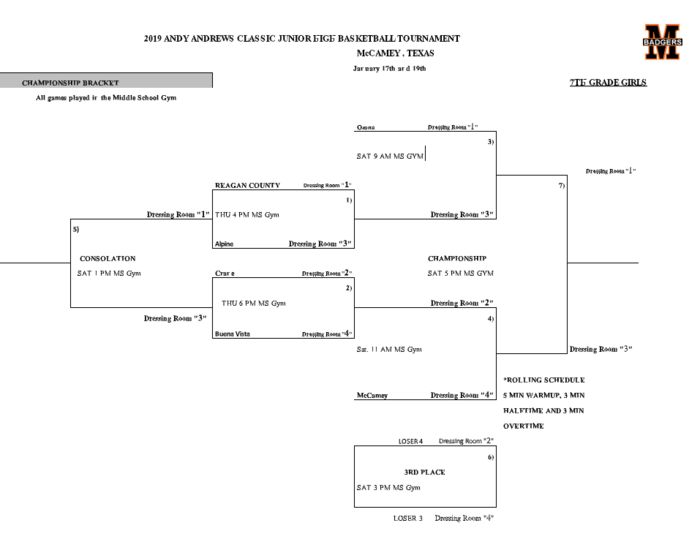 Attached is a bracket for the boys and girls teams. Good Luck and Hook 'em Horns. 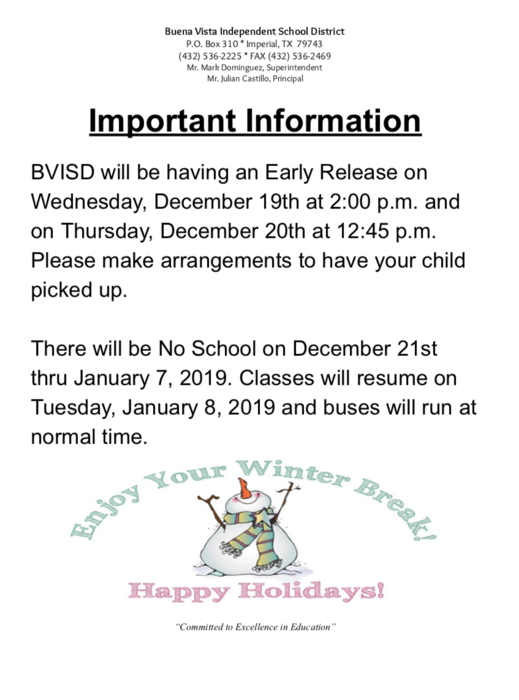 Early Release will take place on Wednesday, December 19th and Thursday, December 20th. Please read the information attached. 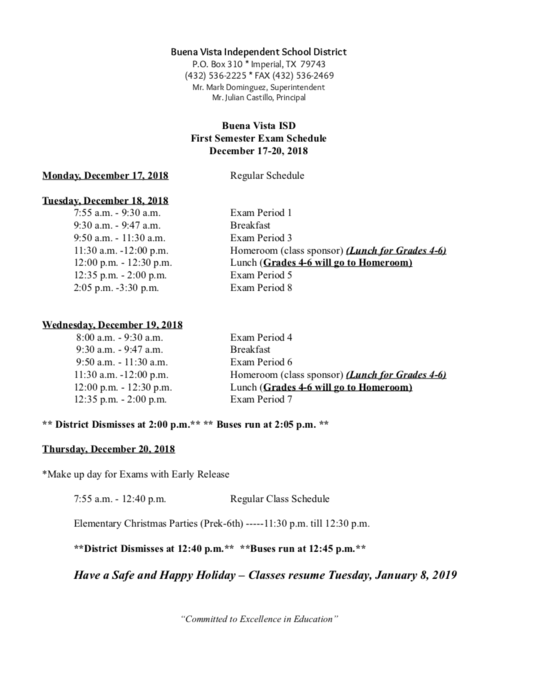 Semester exams will be given on December 18th & 19th. Please see schedule attached. The Varsity Girls came up short today but played a hard fought game. They will play again today at 6:30 against Garden City. Good Luck. The Varsity Boys Basketball team lost a close one to Midland JV, 51-56. They will play again at 3:30 today. Good luck. Congratulations to the JV Girls Basketball team. They defeated Van Horn, 33-25. The girls will play at 3:00 today. The JV Boys Basketball team lost a tough game against Midland Christian. They will play at 11:30 on Sat. The Varsity Boys and Girls Basketball teams will be playing in the Garden City Tournament beginning this Thur., 12/6. Attached is the brackets for both the boys and girls. 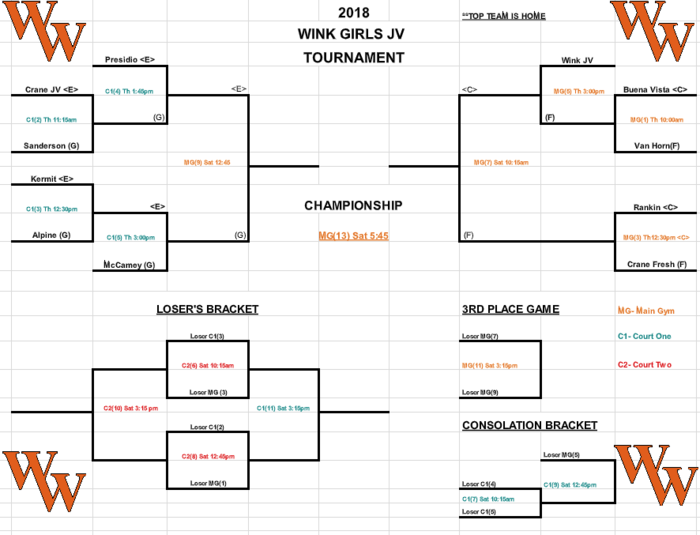 The JV Boys and Girls Basketball Teams will be playing in the Wink JV Tournament. 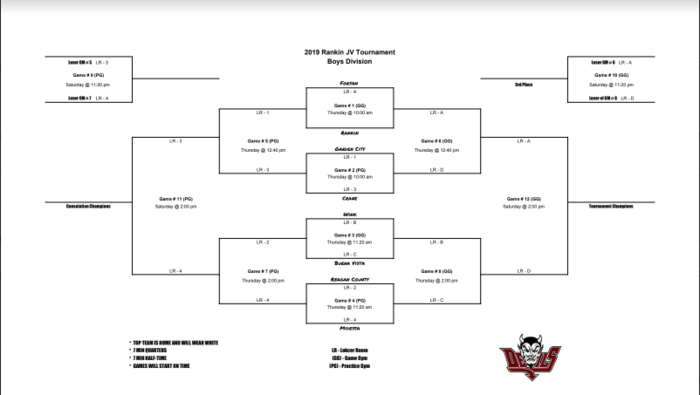 Attached is a tournament bracket for both boys and girls. Congrats to the All-District Football selections. 1st team: receiver Josh Rodriguez, center Justin Sarabia, RB Kendrick Tarin, def. linemen Jovannie Romero. 2nd team: tight end Markus Gomez, RB Jovannie Romero, spread back Matthew Pena, CB Tino Martinez, safety Israel Sanchez. On Tues. 12/4, the JVG, VG, and VB basketball teams will travel to Marfa to play. JVG will start at 5:00 with the VG and then the VB to follow. Good Luck and Hook 'em Horns. The 7th grade boys and girls basketball teams will play at home against Compass Academy on Mon., 12/3, at 5:00. Following the 7th grade games will be the 8th grade boys and girls teams against Sanderson. Good Luck and Hook 'em Horns. On Fri., 11/30, at 5:00, the JVG basketball team will play at home against Alpine and the JVB will play Midland Trinity. The VG and VB basketball teams will play Midland Trinity afterwards. Good Luck and Hook 'em Horns. The JH boys and girls basketball teams will travel to play St. Anns on Thurs., 11/29, at 4:30. The gym is located at 2000 w Texas Midland TX 79701. Good Luck and Hook 'em Horns. The JVG, VG, and VB will play at Iraan on Tues., 11/27, with JVG starting at 5:00 and the varsities to follow. JVB will play Crane in Imperial with tip off at 5:30. Good Luck and Hook 'em Horns. The JV game at McCamey on Sat., 11-17, has been canceled. The VG will now play at 3:00 at McCamey. The JV and VG game on Tues. 11/20, with Crane has been changed. JV will now start at 1:30 with the VG to follow. Odessa bus is running behind as traffic is moving slowly on the interstate. 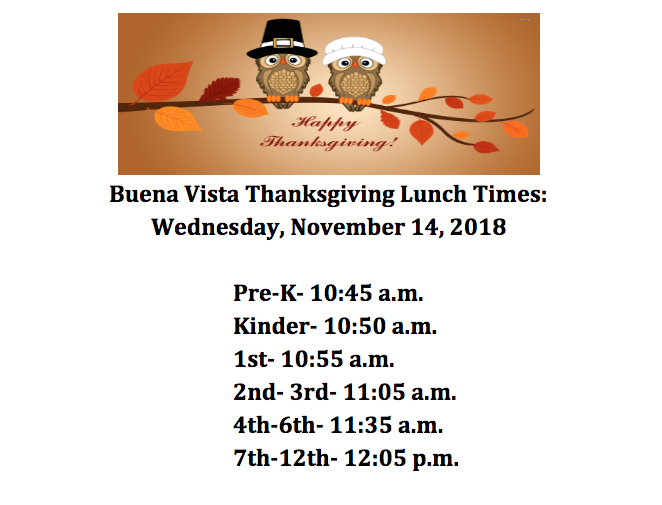 BVISD will have Thanksgiving Break beginning Monday, November 19th through Friday, November 23rd. Buses will run on regular schedule on Monday, November 26th. Odessa bus should be there in about 25 minutes. 5 months ago, Mark Dominguez, Supt. Odessa bus is running behind as we are having bus issues. We are sending a backup bus, we hope to have kids home by 5:15. Contact the school office with any questions. Community Thanksgiving is Wednesday, November 14th. Times are listed below. Tonight, the JH basketball teams will host Rankin. The 8th grade girls & 7th grade boys will start at 5:00 with the 7th grade girls & the 8th grade boys at 6:00. 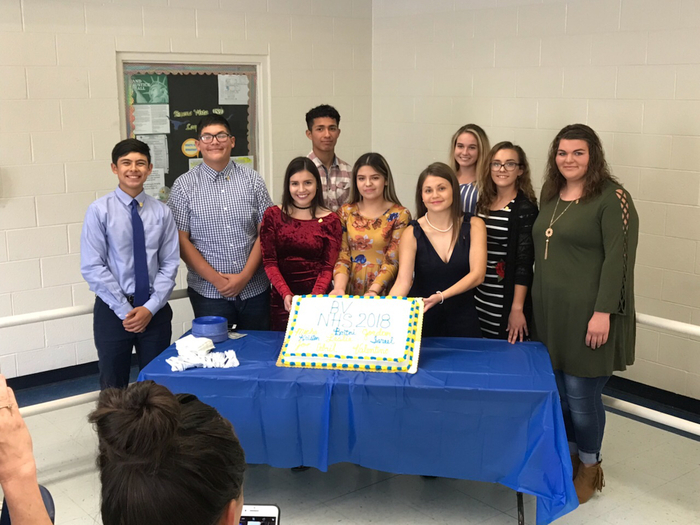 The HS girls will play Sat., 11/17 at McCamey. JV will start at 2:00 and HS girls afterwards. Good Luck. 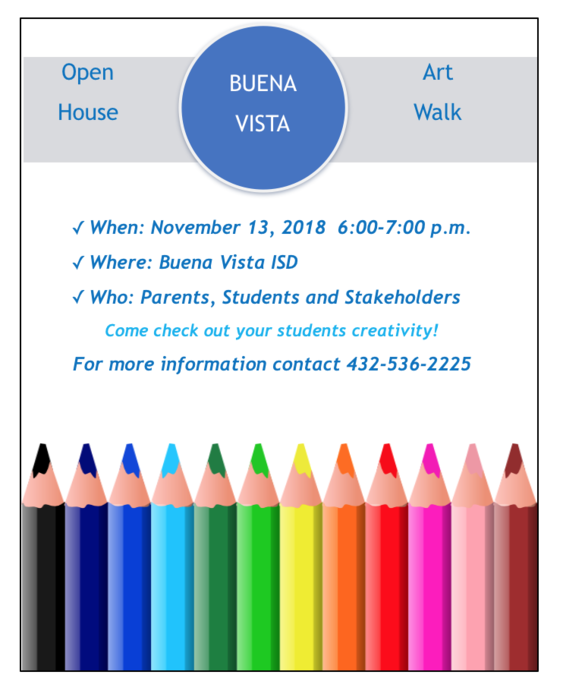 Art Walk/ Open House will take place on Tuesday, November 13th from 6:00-7:00 p.m. The JH and HS football teams will be traveling to Sierra Blanca on Fri., 11/9. The JH will play at 5:00cst and the HS will play at 7:00cst. Good Luck and Hook 'em Horns. 6 months ago, Mark Dominguez, Supt. 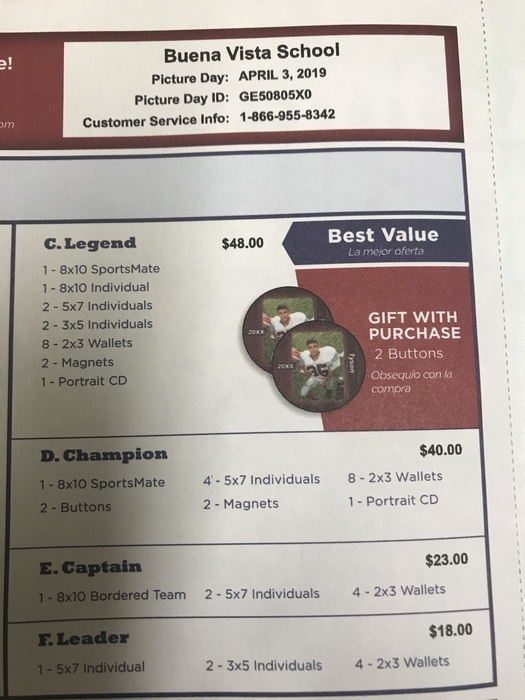 Elementary Fundraiser Pick up will be tomorrow, November 2nd from 2:30 p.m. until 5:30 p.m. in the cafeteria. Area Volleyball Playoff Game Buena Vista vs. Klondike Thursday, November 1, 2018 Kermit HS 4:00 p.m. This Friday, 11/2 before the football game, we will have our parents night ceremony for the Hs football players and Hs cheerleaders. It will begin at 7:00. Parents, please be at the field by 6:45. The game will follow at 7:30. The JH football team will travel to Grandfalls on Thurs. 11/1 to play at 5:00. The HS football team will play Grandfalls at Longhorn Stadium on Friday, 11/2 at 7:30. Good Luck and Hook 'em Horns. 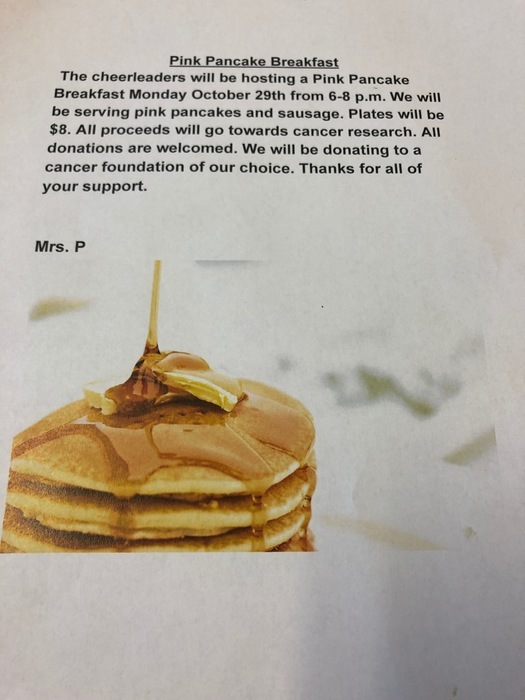 The Cheerleaders will be hosting a Pink Pancake Breakfast tonight- Monday, October 29th from 6-8 p.m. in the BV cafeteria. All proceeds will go towards cancer research. 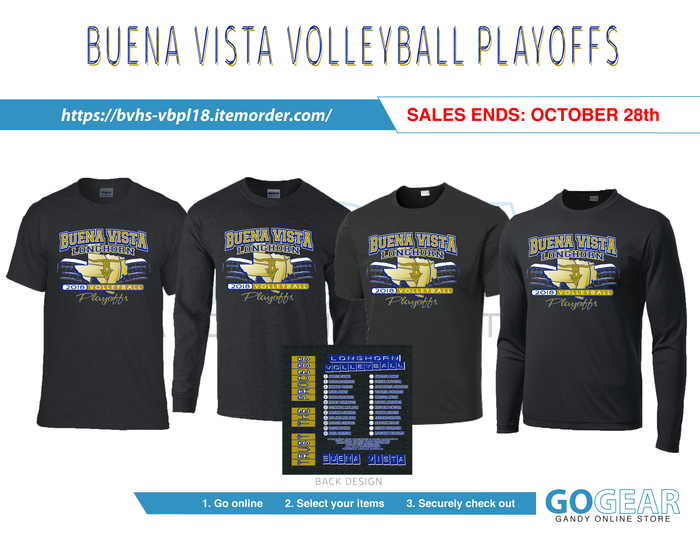 Get your VB playoff T-shirt!! 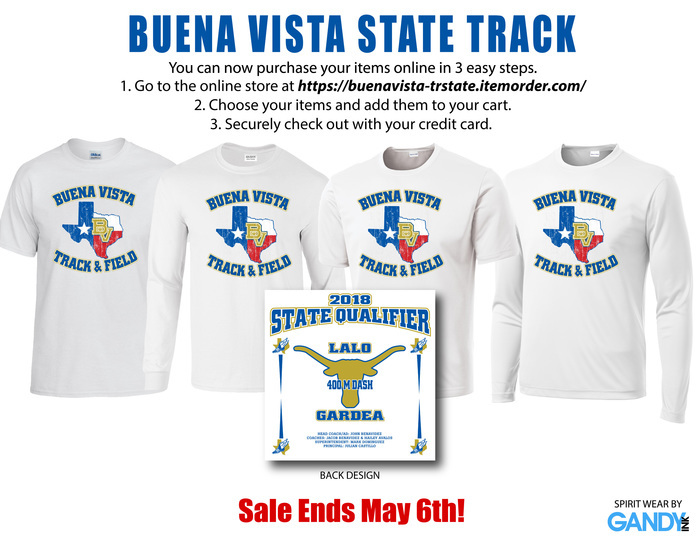 Click on the following link to order https://bvhs-vbpl18.itemorder.com/ and flyer attached! 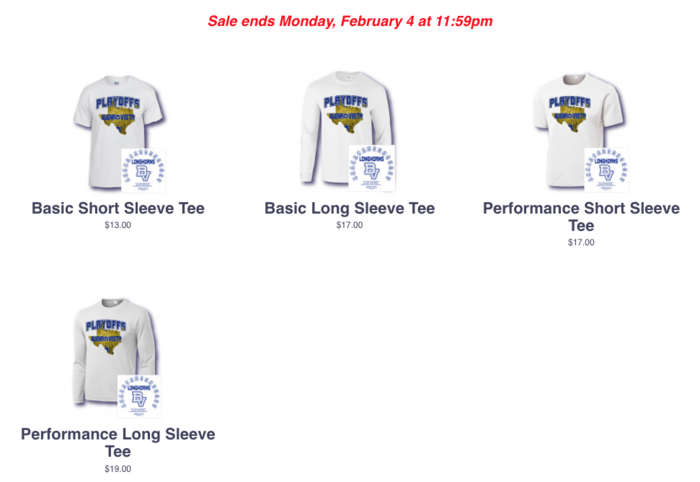 Sale ends Sunday at midnight. The JH football team will host Sanderson at 5:00 on Thursday, 10/25. The HS football team will travel to Sanderson on Friday, 10/26 to play at 7:30. Good Luck and Hook 'em Horns. State Qualifiers XC!! Way to represent BV!! 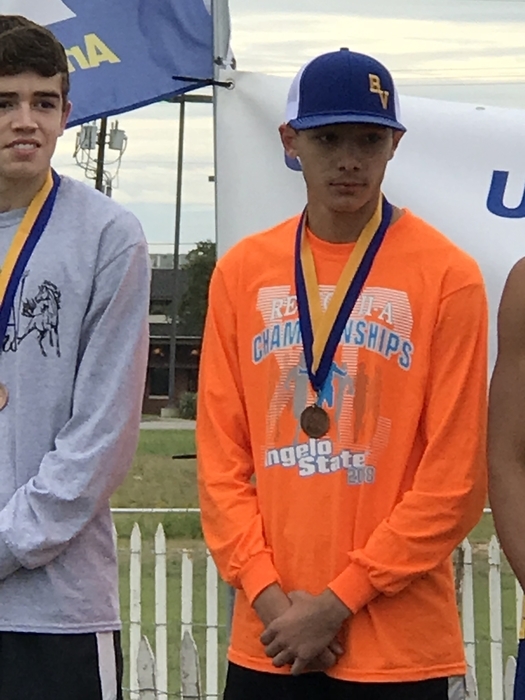 Congrats to Bryam Caballero on qualifying for the State XC meet!! 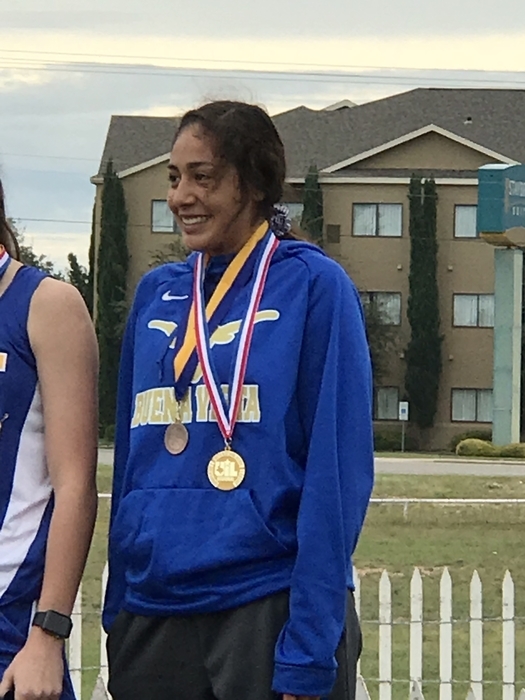 Congrats to Mariana Sanchez Region XC Champion!! Congrats to the girls XC State Qualifies!! Fernanda Malagon & Mariana Sanchez!! 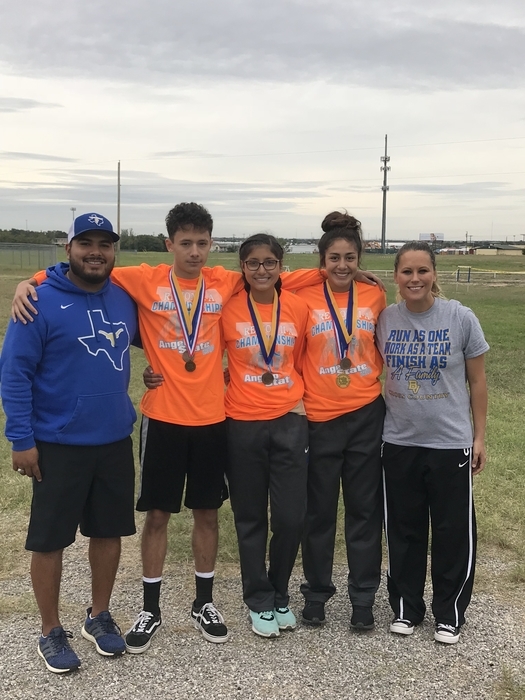 The HS girls and boys cross country teams will compete at regionals in San Angelo on Monday, 10/22. Location of the course is 1620 S. Jackson Street (near Angelo State University Stadium). 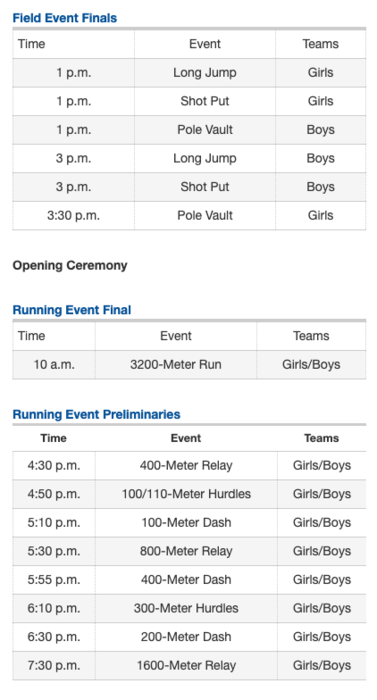 The girls will start at 9:00 am and the boys at 9:30 am. Good Luck and Hook 'em Horns. The varsity football game with Dell City on Friday, 10/19 was scheduled to start at 7:30. However, due to expected weather, it will now start at 6:00. PreK-6th grade field trip to the pumpkin patch in Coyanosa has been rescheduled for Friday, October 26, 2018 due to the weather. We apologize for any inconvenience. Get your Senior Supporter Pass ! 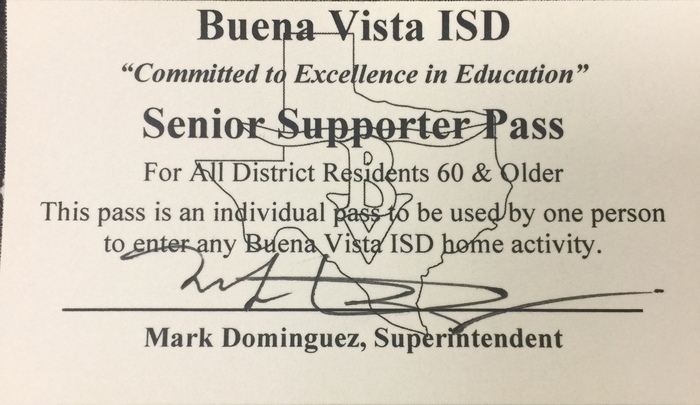 This pass is for all District Residents 60 & Older for free individual admission to enter any BVISD home activity. Come see Kim Dominguez or Superintendent Mark Dominguez to obtain your pass! Individual Senior must pick up pass. The Volleyball game times scheduled for tomorrow have changed. The schedule is as follows: 8th vs. Grandfalls @ 4:30, 7th vs. St. Ann's to follow. Both games will be in the old gym. JV @ 5:00 with varsity to follow in the main gym. The varsity football team will take on Dell City at Longhorn Stadium on Friday, Oct. 19th, at 7:30. Good Luck and Hook 'em Horns. The Jh Football team will play St. Anns on Thursday, Oct. 11th, at 5:30 in Midland. The field is located at 5514 Champions Drive Midland Tx 79706. Good Luck and and Hook 'em Horns. The Jh and High school cross country teams will compete for district at Marathon at The Post on Wednesday, Oct 10th, with high school starting at 2:30. Good Luck and Hook 'em Horns. 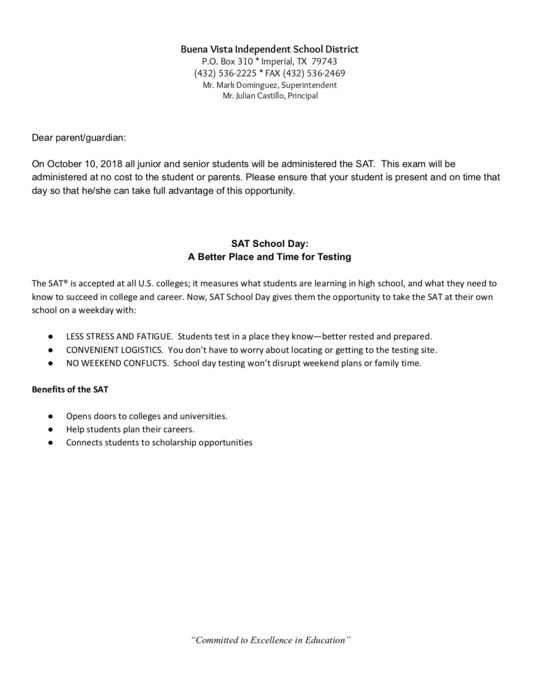 On October 10, 2018 all sophomores, juniors & seniors will be administered the PSAT or SAT. Please ensure that your student is present and on time that day so that he/she can take full advantage of this opportunity. The 7th and 8th grade volleyball games at Kermit on Thursday, Oct. 4th, will now start at 5:00. The JH football team will take on Marfa at home on Thursday, Oct. 4th, at 5:30. The Varsity football team will travel to Marfa on Friday, Oct. 5th, to play at 7:30. Good luck and Hook 'em Horns. The 7th and 8th grade volleyball games for Monday, Oct. 1st have been rescheduled for Thursday, Oct. 4th at Kermit at 4:00. Good luck and Hook ‘em Horns. 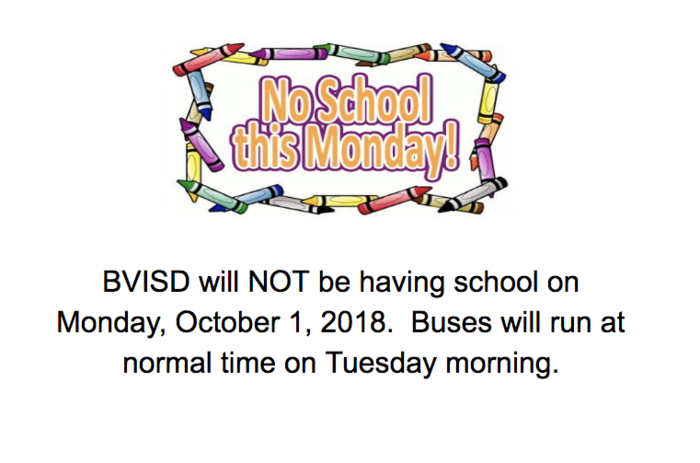 BVISD will not be having school on Monday, October 1st due to staff development. 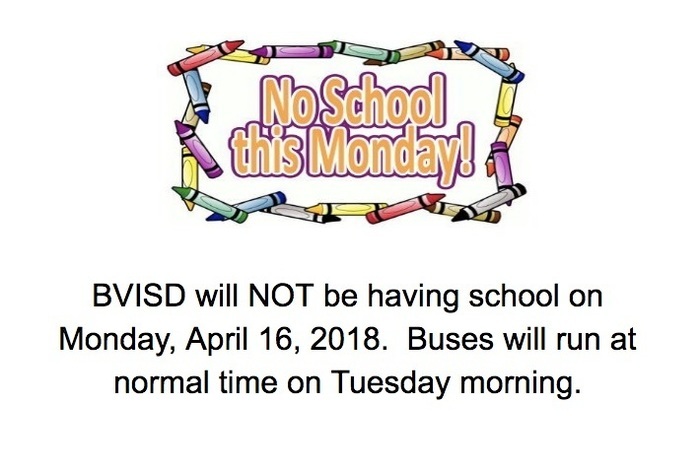 Buses will run at normal time on Tuesday morning. Please disregard previous message of Ft. Stockton bus route leaving at 6:50 a.m. FM1053 has opened up again & bus route will run on regular schedule starting tomorrow (9-25). Sorry for any inconvenience it may have caused. 7 months ago, Mark Dominguez, Supt. Please review the attached letter. 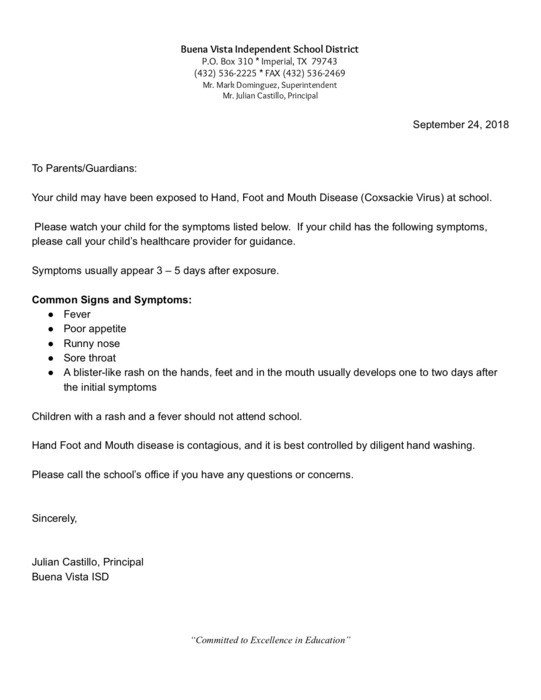 A copy will be sent home with your child tomorrow. 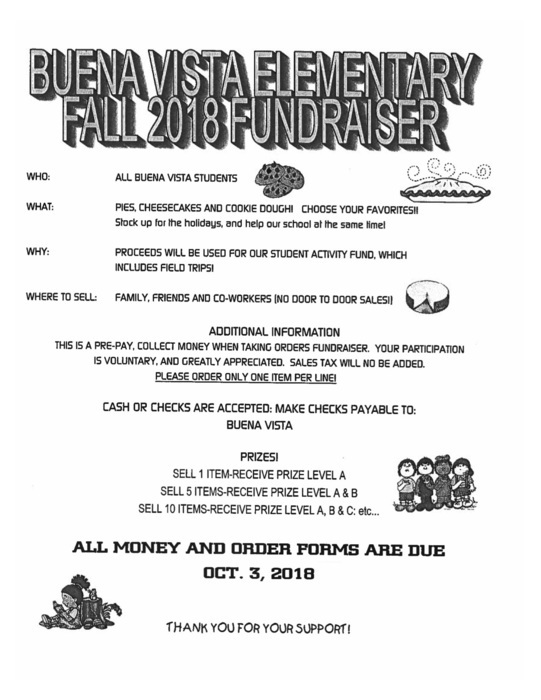 Please support our Buena Vista Elementary Fall Fundraiser. See any elementary student or contact Mr. Castillo for more information. FYI: Due to the closure of FM1053 the Ft. Stockton bus will be departing at 6:50 a.m. instead of 7:00 a.m. starting tomorrow(9/25) morning. 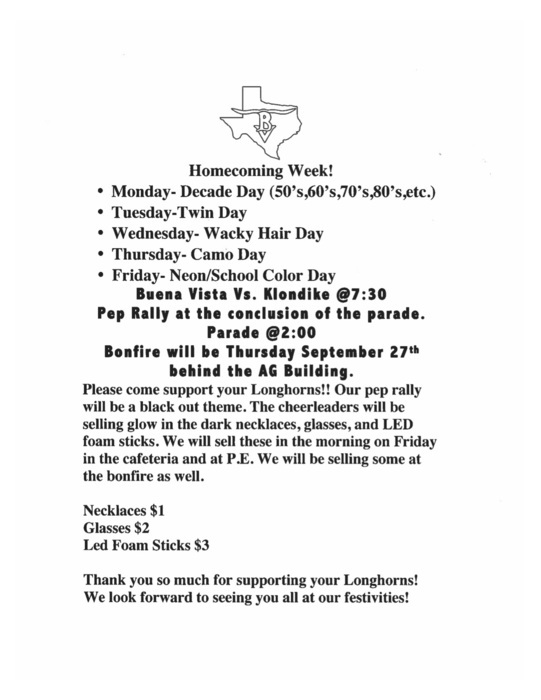 Attached are the Spirit days for Homecoming week. Dress code must be adhered to & will be enforced. Homecoming Parade will take place on Friday, September 28th at 2:00 p.m. Please sign up by Wednesday, September 26th if you plan to participate. 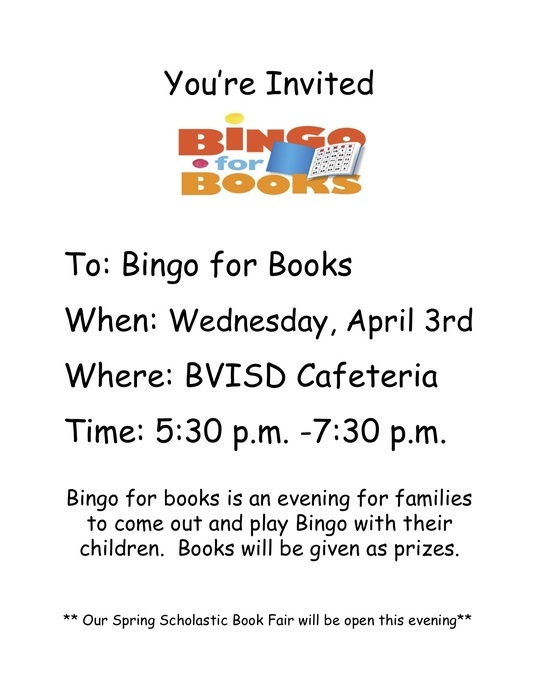 Sign ups are located at the Imperial Public Library or Buena Vista Schools. 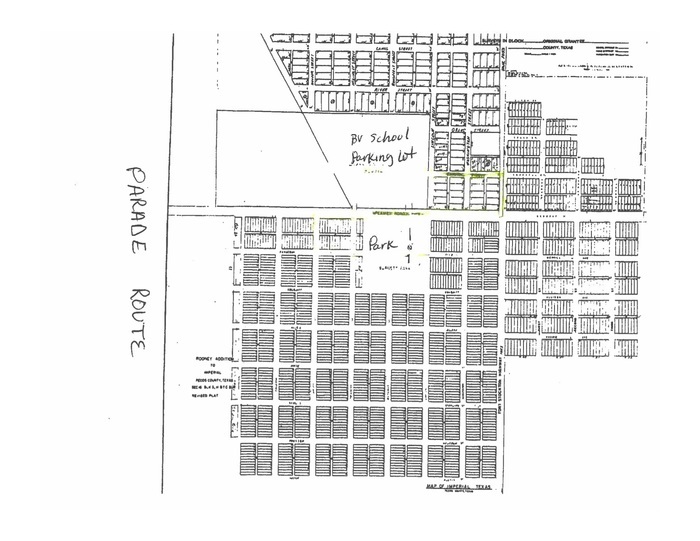 Attached is the Parade route. Friday, September 28th is the end of the first six weeks. 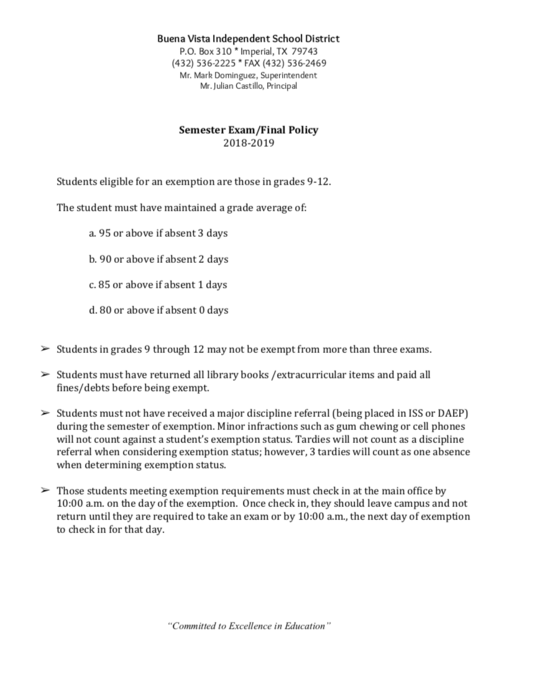 Six weeks test will take place next week. 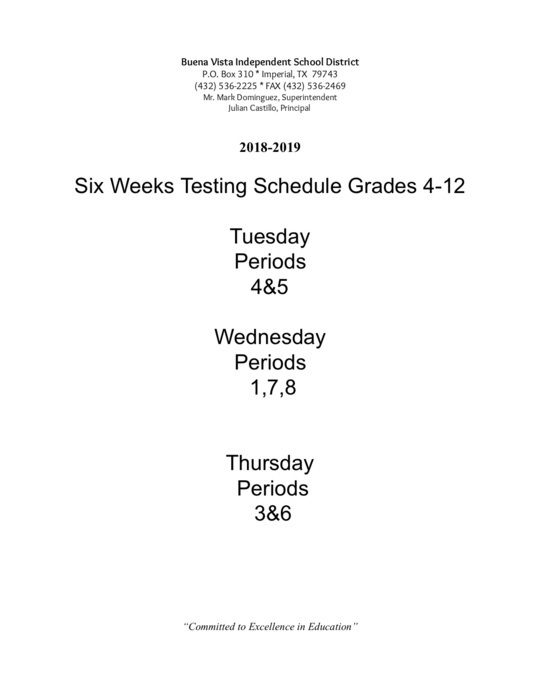 Attached is the six weeks test schedule. The Jh football team will travel to Klondike on thursday, Sept. 27th. Game time has changed from 5:30 to 5:00. There will not be a JV game. Friday, Sept. 28th, the varsity football team will play Klondike for homecoming with festivities beginning at 7:10 and the game to follow. FM 1053 is being detoured. Please bear with us as both of our bus routes are taking alternate routes. We are in route & may be running a bit behind. 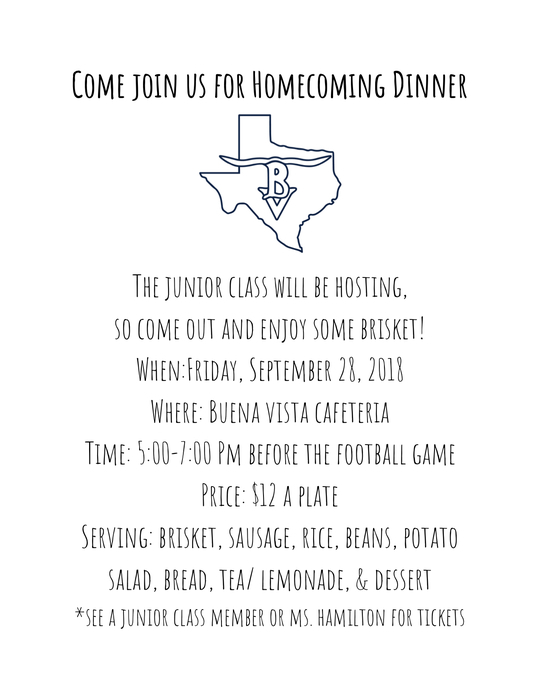 The Junior class is hosting Homecoming dinner next Friday, September 28th from 5- 7 PM at the cafeteria. Tickets are $12 a plate, so see a junior class member or Ms. Hamilton to get yours! The Jh Football team will host Garden City Thursday, Sept. 20th @ 5:30. The JV game has been canceled for Sept. 20th. Jv players will play on the varsity team Friday, Sept. 21st in Garden City @ 7:30. Good Luck and Hook 'em Horns. 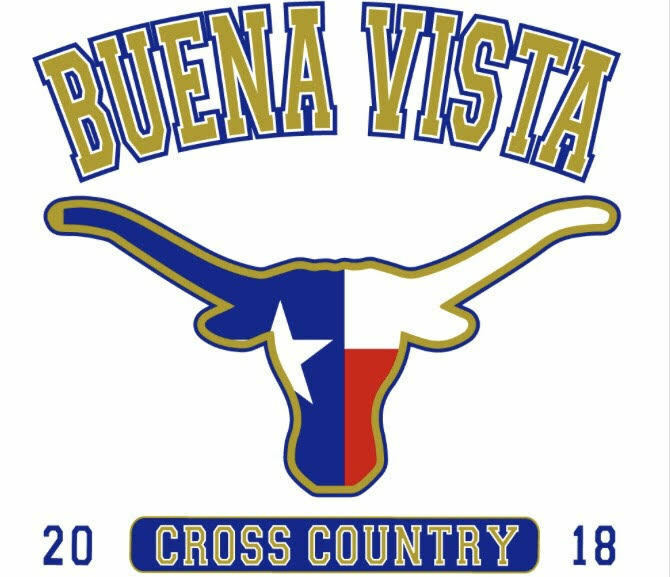 Good luck to the Jh and High school boys and girls Cross Country teams Sept 19th as they compete in the SPRING CREEK XC INVITATIONAL in Mertzon located on Duncan Ave east of Hwy 67. The meet begins with the varsity boys @ 2:00. Hook 'em Horns. Good luck to the JH and High school cross country teams this saturday, Sept. 15th, as they travel to compete at Crane. The course is located at 230 Golf Course Rd. 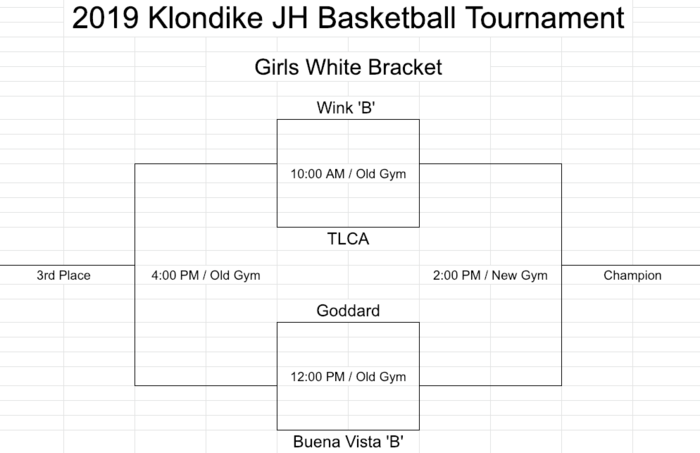 The JH girls will start at 9:00 am with a rolling schedule to follow. Good Luck and Hook 'em. FYI: Due to the closure of FM1053 the Ft. Stockton bus will be departing the at 6:50 a.m. instead of 7:00 a.m. starting tomorrow(9/11) morning. BV 0--SC 50 final 3rd qtr. The cross country meet this Saturday, Sept 8th, in Wink has been canceled due to weather. Coyanosa bus will be departing early today at approximately 2 p.m. due to road conditions on FM 1450. Due to closure of FM1053. Coyanosa & Ft. Stockton students traveling on BVISD buses will be rerouted towards Grandfalls where they will access HWY18 & then proceed to their destination; we will not travel on FM1053 until the road is deemed safe by TxDOT. Mark Dominguez, Supt. The JH and High school boys and girls cross country teams will compete Sept 8th at Wink beginning at 9:00 am with the JH girls. The course is located 8 miles West of Kermit on Hwy 302 at the Winkler County Golf Course. Good Luck and Hook 'Em Horns. 8 months ago, Mark Dominguez, Supt. The JV football team will play at home on Sept 6th at 5:30 against Sterling City. The Varsity football team will travel to Sterling City on Sept 7th to play at 6:30. Good Luck and Hook 'em Horns. 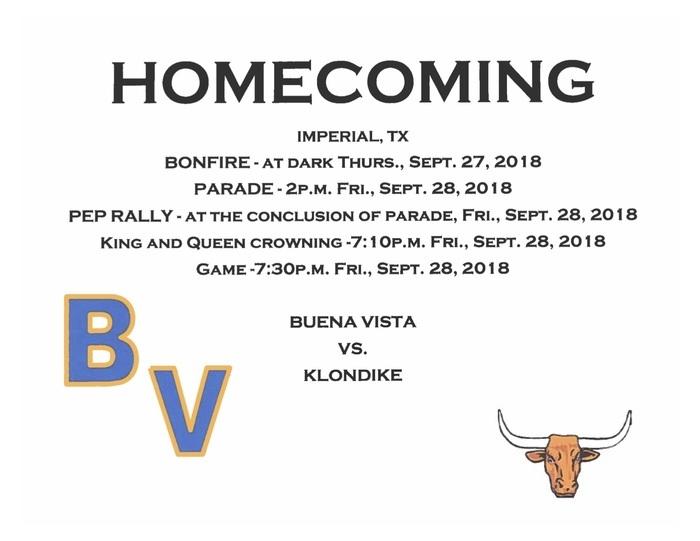 Homecoming 2018 will take place Friday, September 28th. All activities are listed on the Flyer. Don’t forget to bring your donations tomorrow. Your teacher may be getting a pie in the face tomorrow during the pep rally. The JV game for this friday, Aug 31 @ 5:00 has been canceled at our opponents' request. The high school will still play at 7:00 against West Texas Homeschool. We have meet the Longhorns Aug 29 at 7:00pm. Please have students who will be participating in the event at the school by 6:40pm. We will have watermelon from MBP afterwards. Hope to see you there and HOOK EM. Good luck to our JH and High school cross country runners this Thursday, Aug 30th. They will be competing in Van Horn beginning at 5:00pm at the high school baseball field. Hook 'Em Horns! 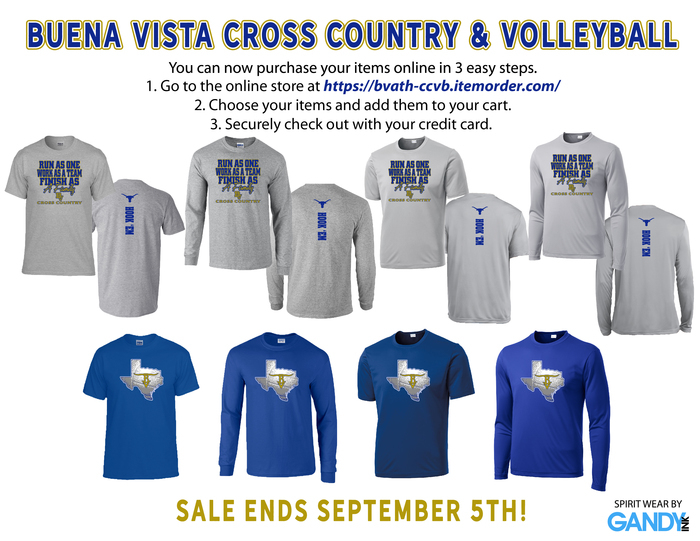 Order your Cross Country & Volleyball T-Shirts!! 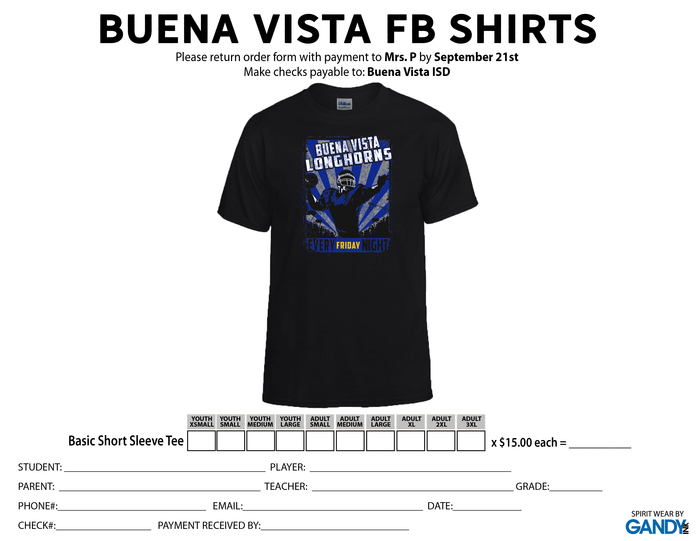 The link for the online stored is https://bvath-ccvb.itemorder.com/ Orders are due Wednesday, September 5. Contact Coach JB/Coach Dominguez with any questions. First football game of the season will be this friday, Aug 31 at Longhorn Stadium with JV Vs. Balmorhea JV @ 5:00pm and Var Vs West Tx Homeschool to follow at 7:00pm. Please come and cheer your Longhorns on to Victory. Our Buena Vista Ag department will be hosting an “Ag Day” for our students on Friday, August 24th from 9:00 -11:00 a.m. Elementary students will view and learn about various livestock animals. Meet the Longhorns will be on Wednesday, August 29th at 7:00pm at Longhorn Stadium. Coyanosa bus had some troubles this a.m. Students & driver are safe & headed to school; they did have to switch buses. HS Football scrimmage has been changed for this Friday(8/24). BV Football team will be going to Hermleigh ISD instead of Loraine. The scrimmage will be against Westbrook & Hermleigh at 6:00 p.m. Should you have any questions or concerns, feel free to contact Coach P.
To ensure that our students & teachers remain safe, our district will be implementing a new check-in policy. Please help us make this a smooth implementation. 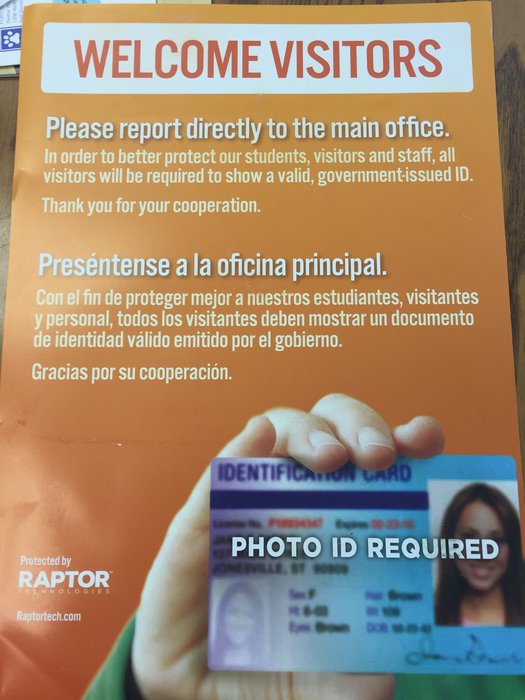 In order to enter the school a state issued ID will be required. Once visitors check-in a pass will be provided. Should you have any questions/concerns, please contact me. All 9-12 grade students will need to meet with Ms. Griffin our school counselor to finalize your schedule for the upcoming school year. She will be available on 8/16 from 8-12 and 1-4 and on 8/17 from 8-12. BVISD would like to encourage Parent's & Guardians to fill out their cafeteria application on-line at http://www.bvisd.net/my-school-apps Paper applications are available at the front office. 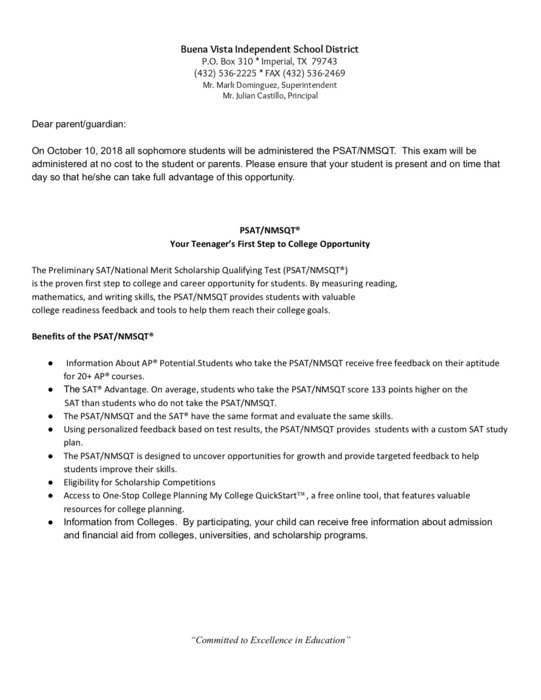 Contact Mrs. Kim Dominguez with any questions. 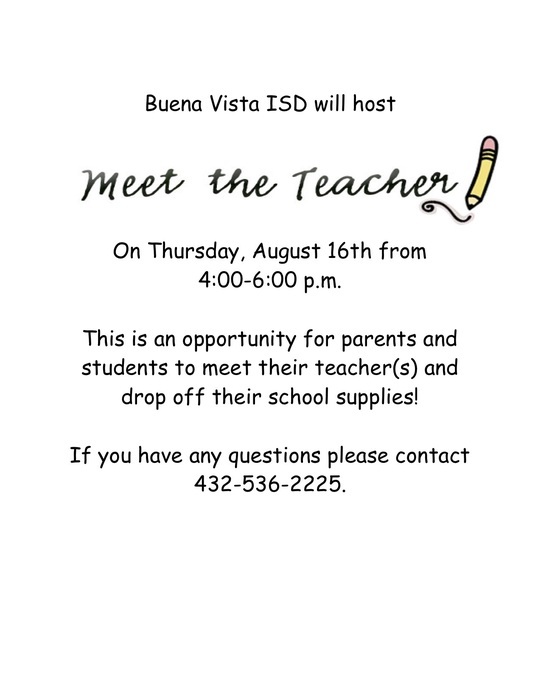 Meet the Teacher will be on Thursday, August 16th from 4:00-6:00p.m. HS volleyball practice begins tomorrow, Wednesday at 6:00 p.m. Make sure to show up at 5:30 p.m. for a short meeting prior to practice. HS volleyball scrimmage on Friday (8/3) at 4:00 pm at BVISD. 9 months ago, Mark Dominguez, Supt. 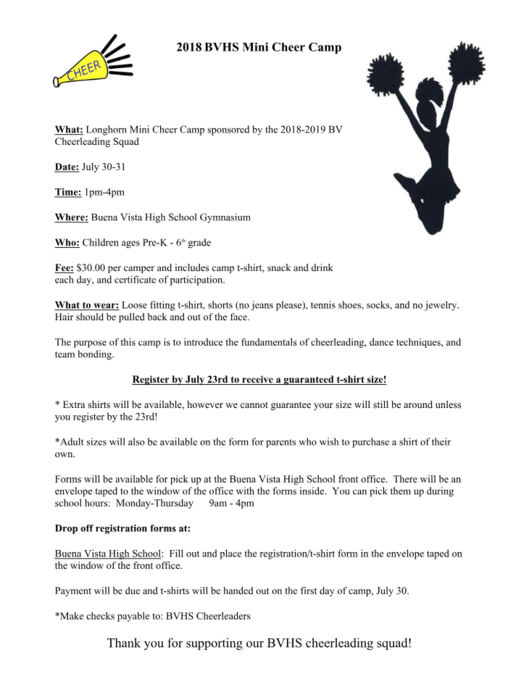 Mini Cheer camp will take place on July 30 & July 31. 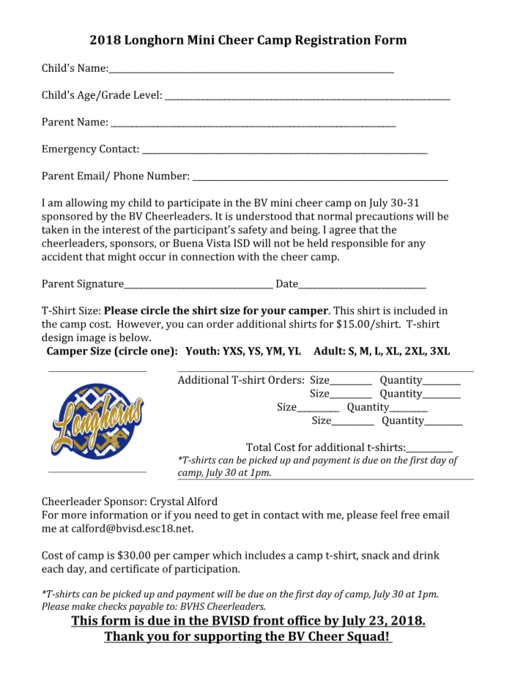 Please register by July 23rd to receive a guaranteed t-shirt size. Forms available for pick up at BVISD front office. BV Cheer will be having a bake sale on 7/6 starting at 7 am at the 4 way stop in Imperial. Wishing everyone a Happy Fourth of July!! In observance of Independence Day, BVISD offices will be closed. 10 months ago, Mark Dominguez, Supt. 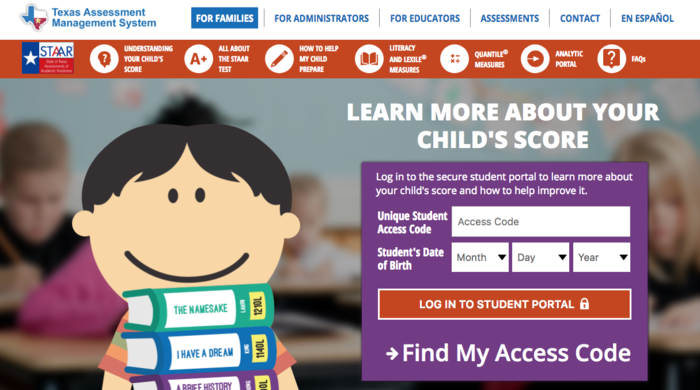 Check out the BVISD website for more information on how to log into the student portal to check your students STAAR scores coming available June 13th. All Admin offices will be closed today due to training. 11 months ago, Mark Dominguez, Supt. Congrats to the BVHS Senior Class of 2018! !Good Luck in your future endeavors! Early Release Tomorrow 5/24/18 at 1:05 p.m. 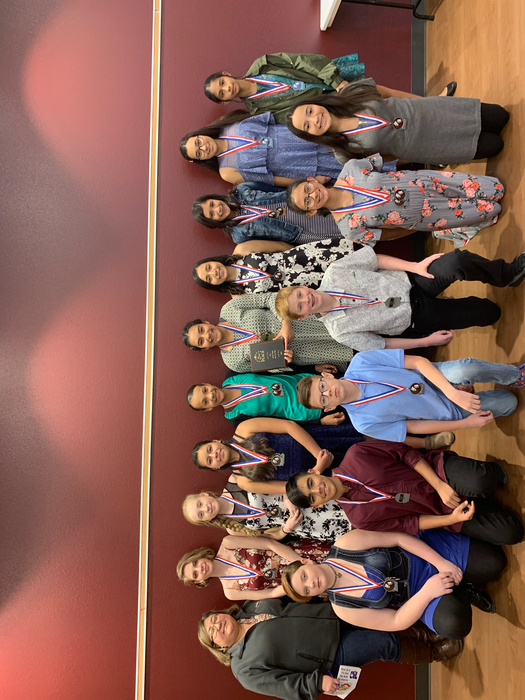 Buses will run @ 1:10 p.m. 5/24-Elementary/ Junior High Awards @ 9:00 a.m.
Upcoming Events: BVISD HS Awards Ceremony- Tuesday, May 22nd in the Auditorium 6:30 p.m. Elementary/Junior High Awards-Thursday, May 24 9:00 a.m.
Change of Date & Time for Athletic Physical: FREE physical exams will now be on Wed. (May 16th) at Ft. Stockton Middle School from 2-4:15. Sorry for any inconvenience this may cause. 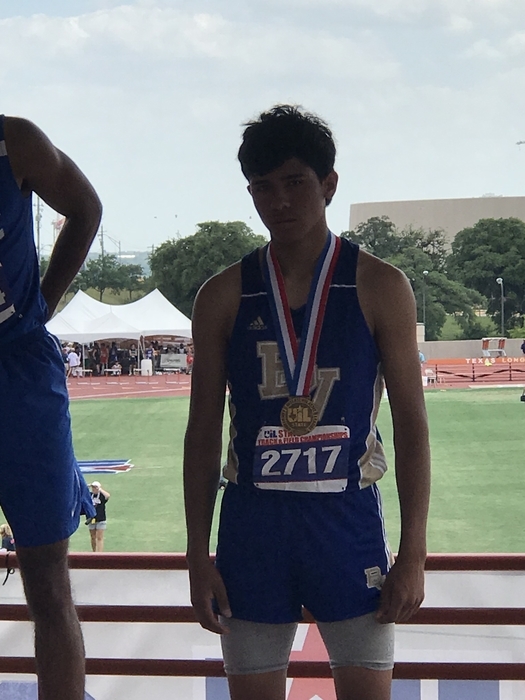 Congrats to Lalo!! 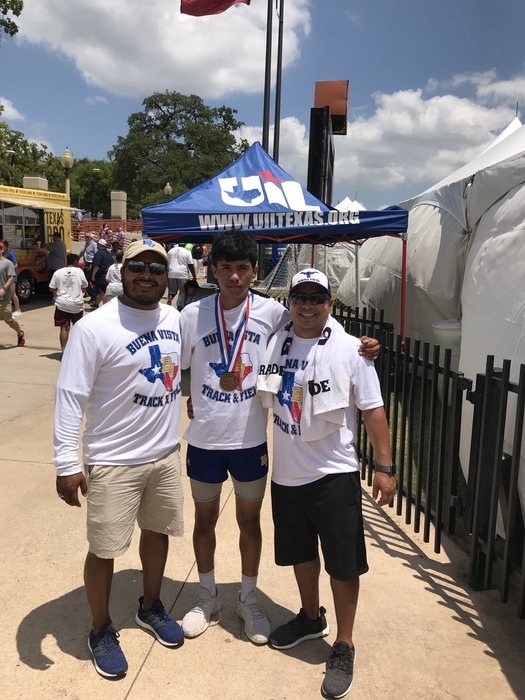 Great job Lalo & Coaches!! 8th grade HB 5/ Parent meeting will take place today at at 6 pm in the BVISD library. BVISD has teamed up with Pecos County Hospital and FSISD to perform FREE physical exams on Thursday (May 17th) at Ft. Stockton High school from 2-4:15. Please sign up in Coach B's office. 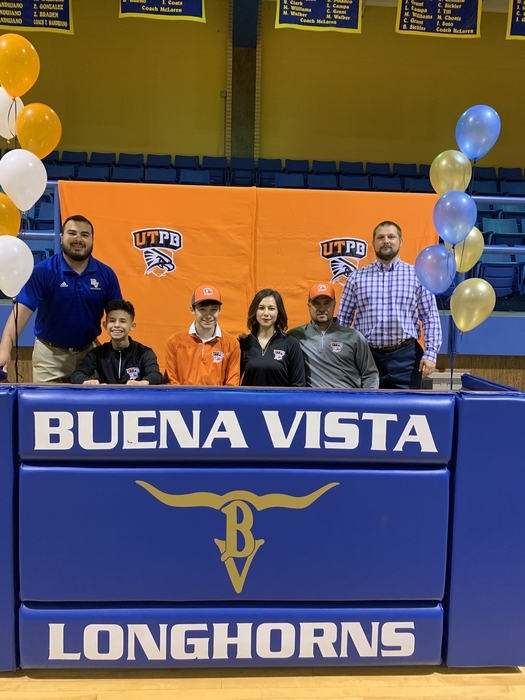 BVISD would like to Welcome the Longhorn Class of 2032! 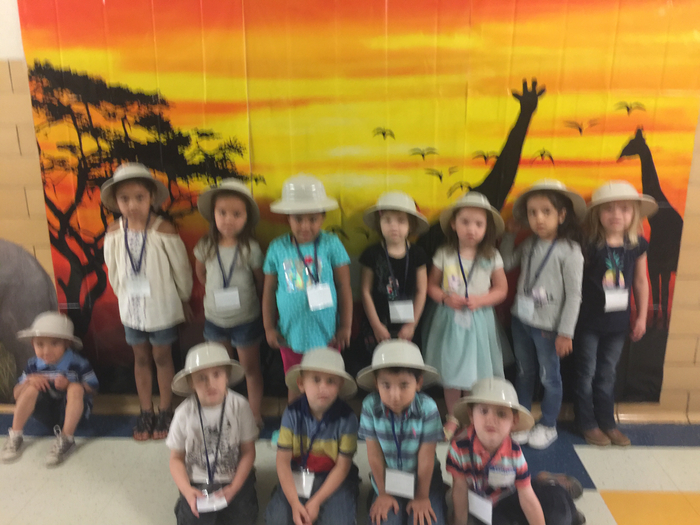 PK round up students!! 12 months ago, Mark Dominguez, Supt. Fs bus will be running late due to a driver mix up. Hope to be there by 7:30. Sorry for the inconvenience. Ath. Events 4/23-4/28 Fri. 4/27 & Sat. 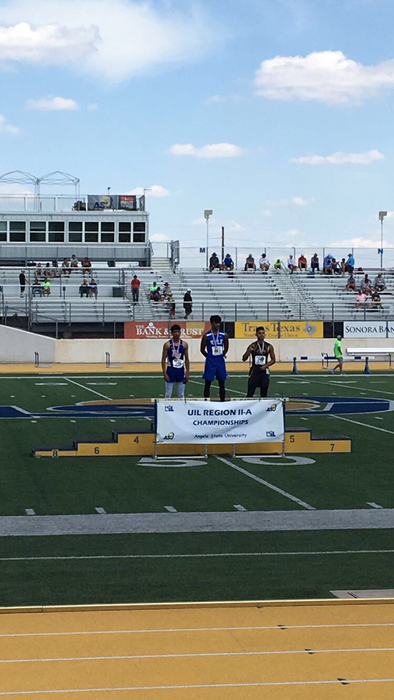 4/28: The HS Track & Field team will be competing in the UIL Regional Track Meet in San Angelo. Sat. 4/28: The JH Tennis team will be competing in the Big Lake Tournament on Saturday. about 1 year ago, Mark Dominguez, Supt. Ath Events 4/16-4/22 4/17&4/18: HS Regional Tennis @ San Angelo 8 am 4/20: HS Track Reg. Qual. 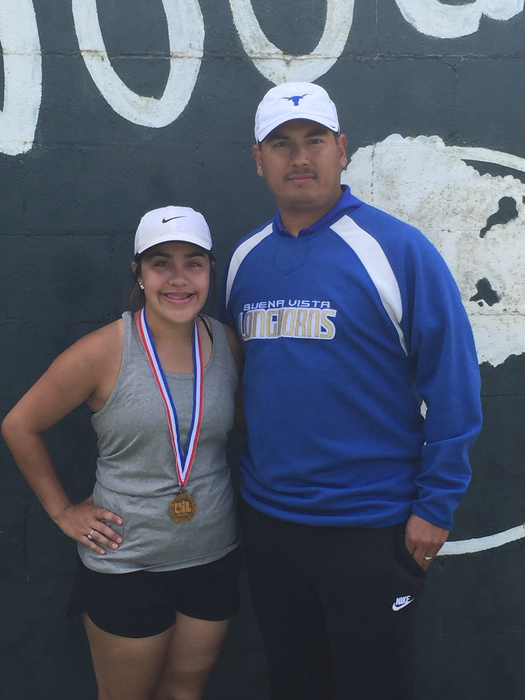 Meet @ Loving NM 3pm 4/21: JH Tennis @ Ft. Stockton 8:30am Good Luck to all participants!! Come support your BV cheer bake sale. Happening now at 4 way stop in Imperial. Due to the grass fire near I-20 and FM 1053 the Odessa bus route will be re-routed through Crane today. Good Luck to all students taking STAAR Tests today!! 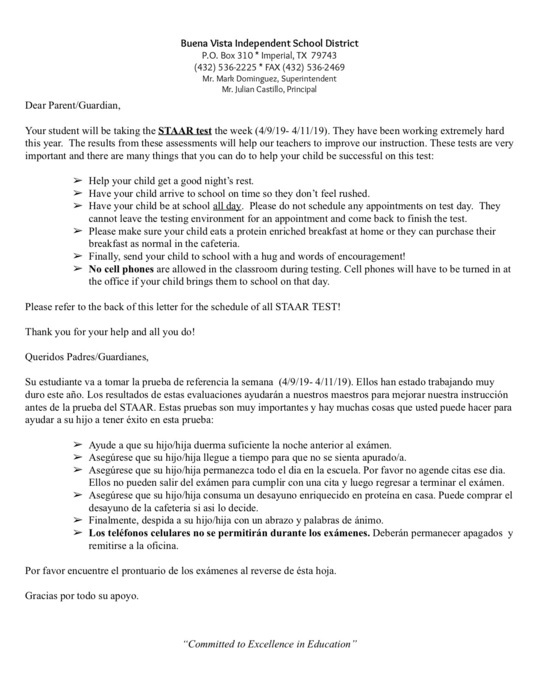 Testing today are grades 4 & 7 Writing, 5 & 8 Math, & English I EOC. Give it your best shot and be a shining star today!! Good Luck to the Junior High Tennis Teams today playing in Sanderson today at 4pm!! 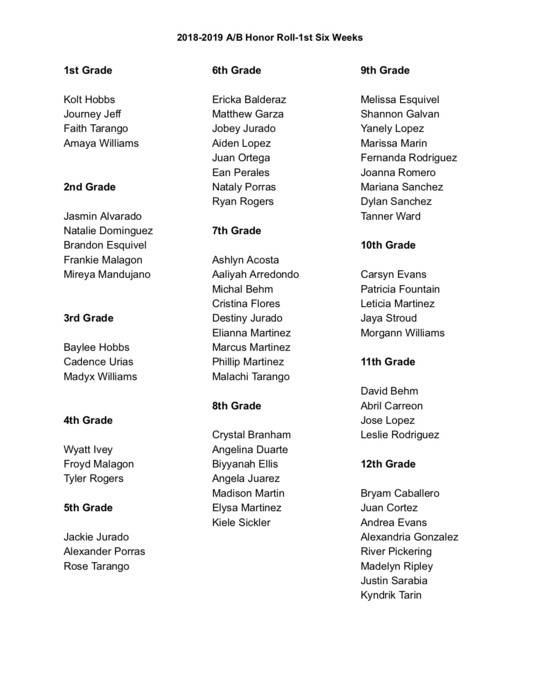 Good Luck to all students competing in the District UIL Academic Meet in Rankin toady! 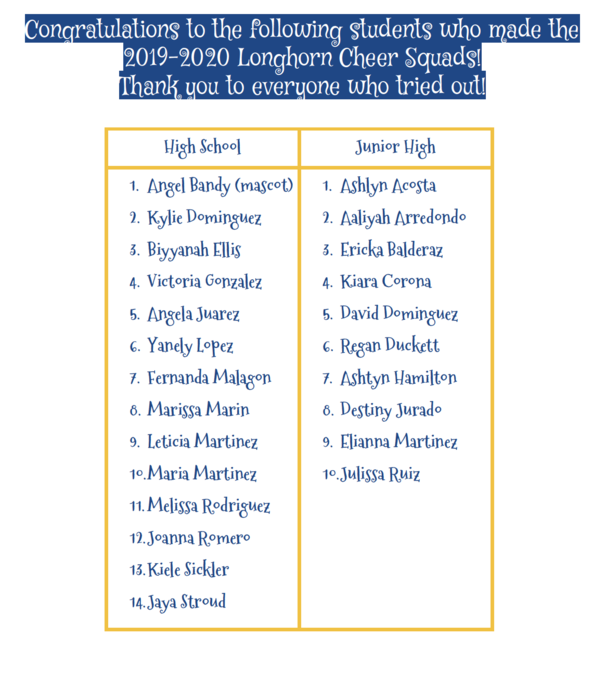 It's a GREAT day to be a LONGHORN!